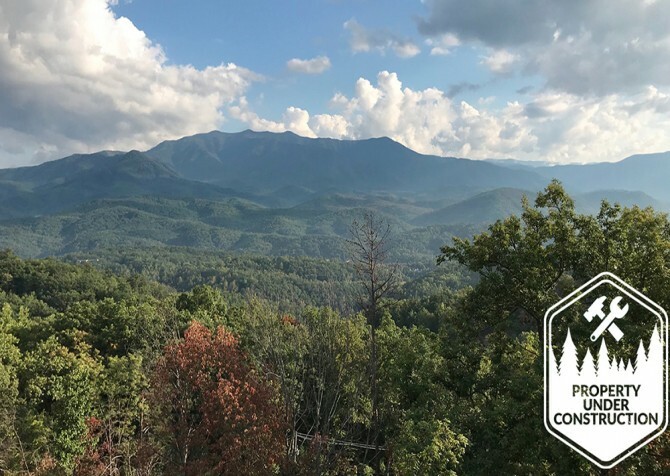 Packed with amenities and perfectly situated near downtown, high atop the mountains, or tucked among the trees, our Gatlinburg cabins offer plenty of options for YOU. 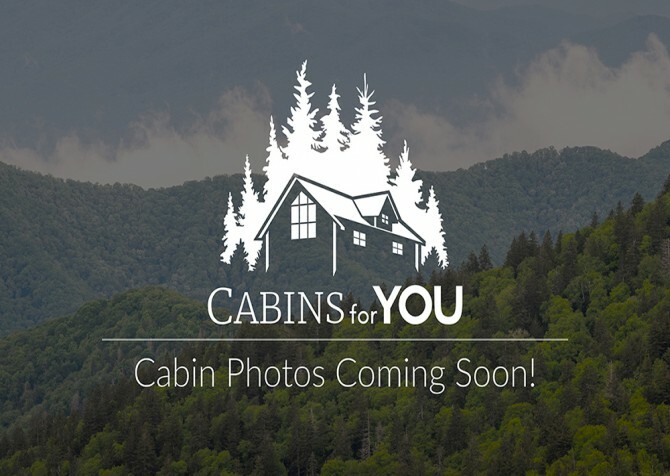 Along with cabins within walking distance of downtown, we also have properties in Ski Mountain, Chalet Village, Cobbly Nob, and Pittman Center! Call us at 1-800-684-7865 or browse our Gatlinburg cabin rentals. We look forward to helping find the right Gatlinburg cabin for YOU! 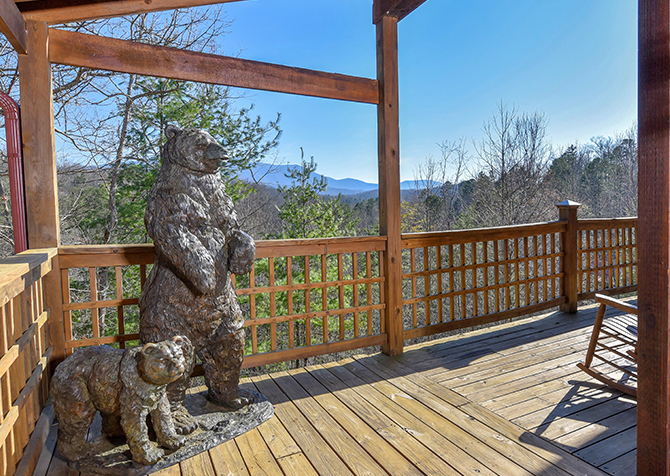 Pack your bags and head to A Blissful Bear, your unforgettable Smoky Mountain retreat for up to 6 guests in Gatlinburg, TN! 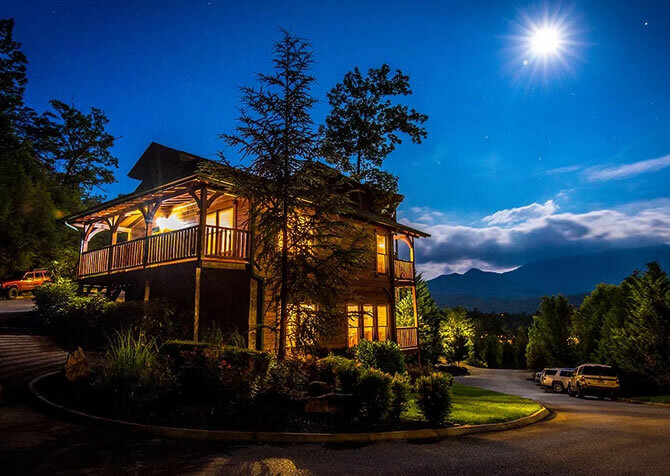 Walk to the Great Smoky Arts & Crafts Community, play pool with friends, watch feature films on the big screen TV with Blu-ray player, soak in the wooded view from the bubbly hot tub, whip up breakfast feasts in the fully equipped kitchen, and rest in a king-size bed every night. 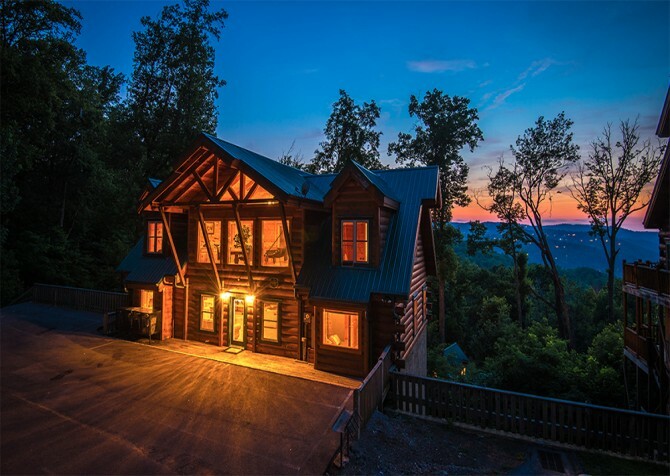 Located in Gatlinburg, A Dream to Night is a semi-private cabin boasting 3 bedrooms, 2.5 bathrooms, and plenty of room for 6 guests. Play pool every evening in the rec area, watch feature films on the flatscreen TV, soak away your troubles in the sunken hot tub, sip moonshine in the deck chairs with woodsy views, and head for the master suite’s jetted tub before jumping on the king-size bed. Families and groups of up to 8 guests should check out a modern mountain oasis tucked away in the Smoky Mountain trees. 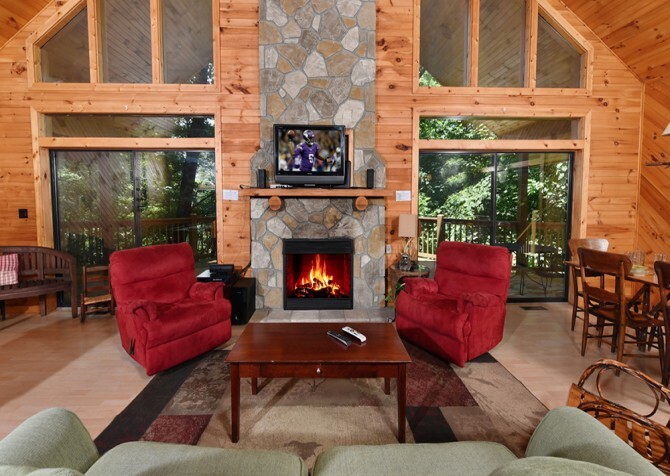 As Good As It Gets is a private getaway that’s conveniently located less than 7 miles from downtown Gatlinburg. 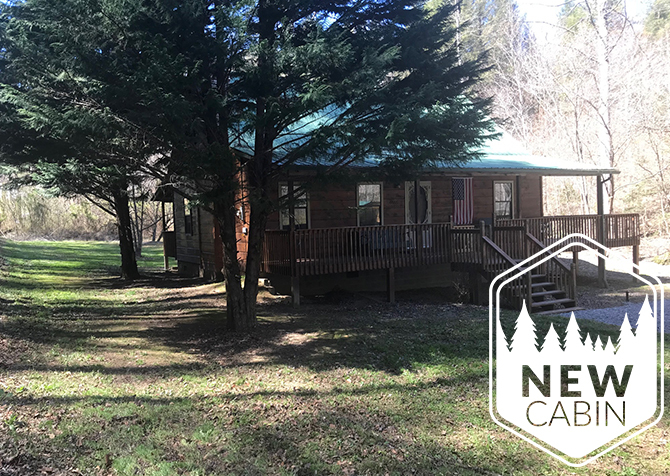 Enjoy all the comforts of home, as well as a pool table, an outdoor hot tub, and more at this 2-bedroom cabin that's even pet friendly! 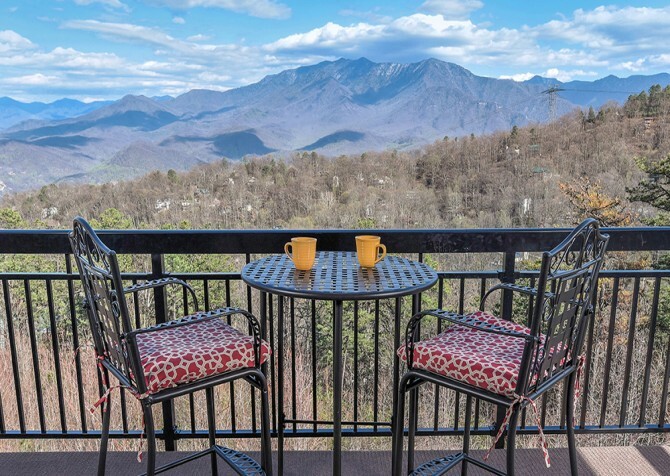 Enjoy the perks of a secluded cabin resort community and the accessibility to downtown Gatlinburg while staying in Smoky Mountain Escape! 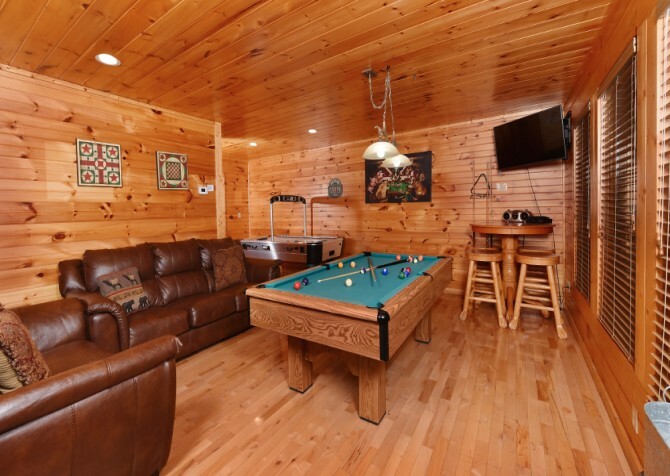 The 2-bedroom, 2-bathroom cabin for 10 has awesome amenities like a pool table, arcade game, and air hockey to keep kids and adults entertained at the cabin. In town, play at attractions, grab a bite to eat, or do some shopping at the many unique shops! 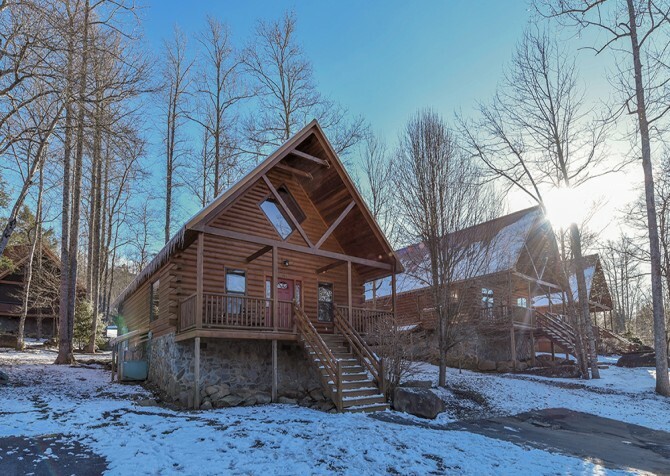 Tucked away less than 4 short miles from downtown Gatlinburg, Tennessee, this Smoky Mountain cabin for 6 in Chalet Village Resort offers 2 bedrooms, 2 bathrooms, a fully equipped kitchen, multiple decks with woodsy views, and king-size beds. Plus, everyone will enjoy the wireless internet, community pool access, PlayStation 2, and outdoor hot tub! 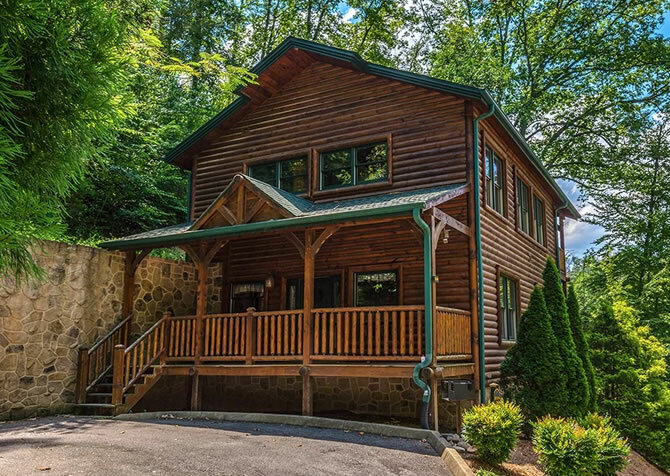 Just 5 miles from downtown Gatlinburg, this 3-bedroom, 3 ½-bathroom cabin is close to the attractions, shops, and restaurants of the parkway. 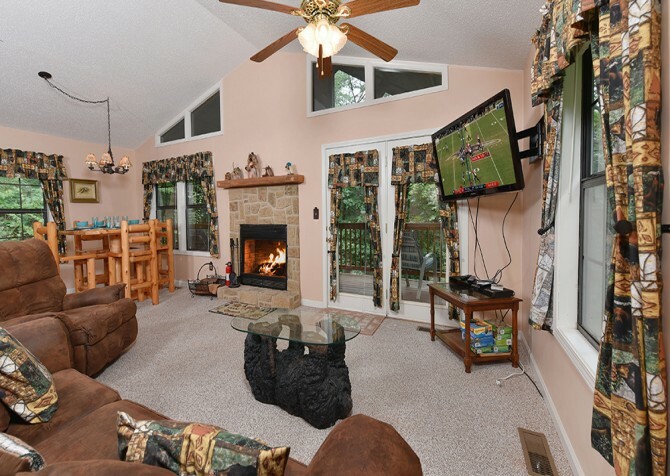 Squirrel's Nest features a big screen TV, pool table, and high-speed wireless internet for staying connected. 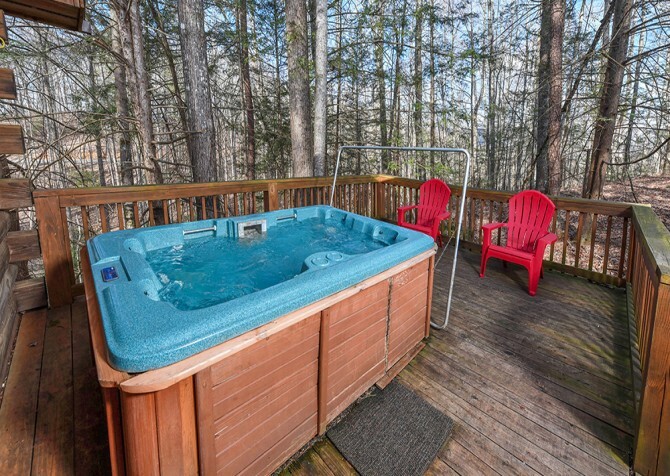 Or disconnect while enjoying time outside with a hot tub, table, and the fresh mountain air. A truly unique property, Splashin' Treehouse boasts a private indoor pool and a floor-to-ceiling tree fireplace. Windows and doors are trimmed with bark, and lots of windows throughout bring in plenty of natural sunlight. Stay entertained with the foosball and pool tables, Blu-ray player, big screen TV, Xbox, dartboard, and multi-game arcade. 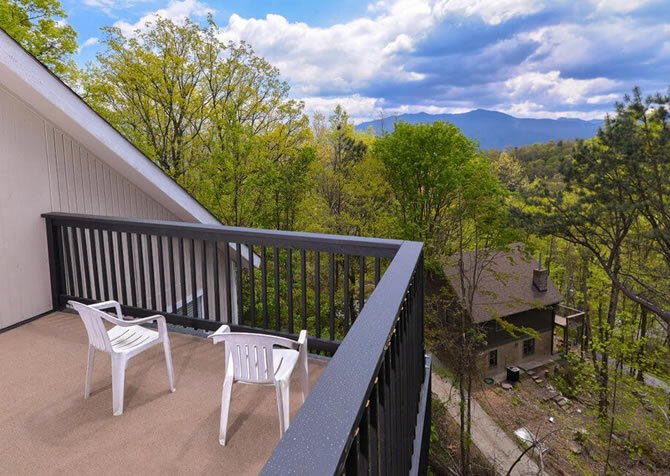 Boasting easy roads plus a flat, paved driveway, this 2-bedroom Gatlinburg cabin for 6 makes traveling to the national park and downtown fun a breeze! And you’ll have access to exciting in-cabin amenities, like the steamy hot tub, indoor jetted tub, pool table, board games, 50-inch TVs, gas fireplace, screened-in deck, and king-size master suite. A classic Smoky Mountain escape, Sweet Pickins offers the comforts of home and more. 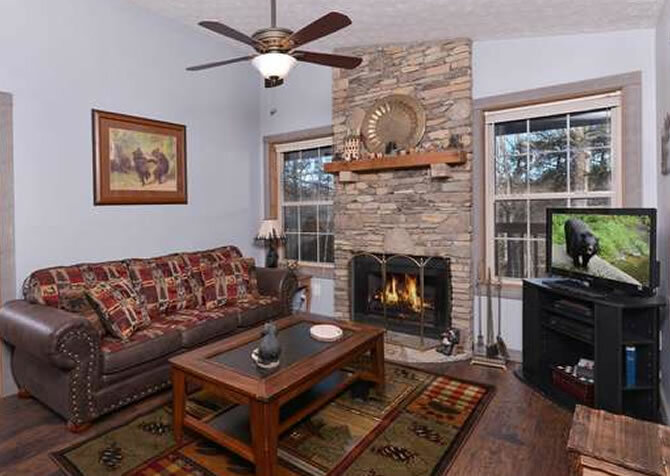 This 1-bedroom Gatlinburg cabin features a hot tub in a screened-in porch, a living area with a fireplace and TV, a full kitchen, an indoor jetted tub, and an air hockey table! Whether you're headed to the mountains for a small family getaway or celebrating a special occasion, you'll find comfort, fun, and relaxation here. 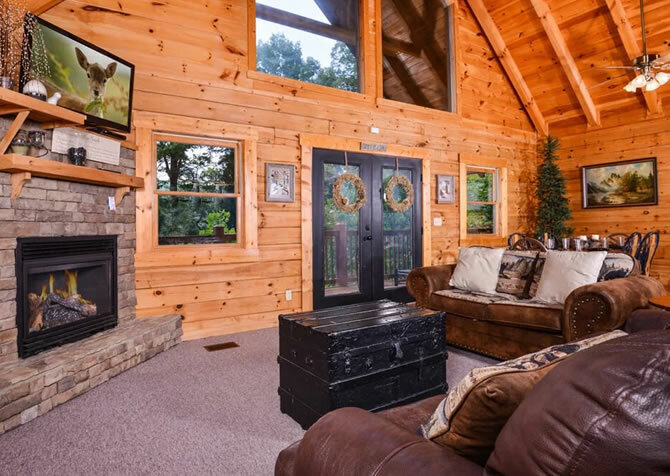 Perfect for a romantic escape in the Smokies, this Gatlinburg cabin boasts wooded views, a king-size bed, 1,100 square feet of space, a wood-burning fireplace, hot tub, wireless internet, a pool table, and access to a community pool in the Chalet Village community. It's just a short drive from downtown attractions and restaurants, yet it offers a peaceful and semi-private setting. 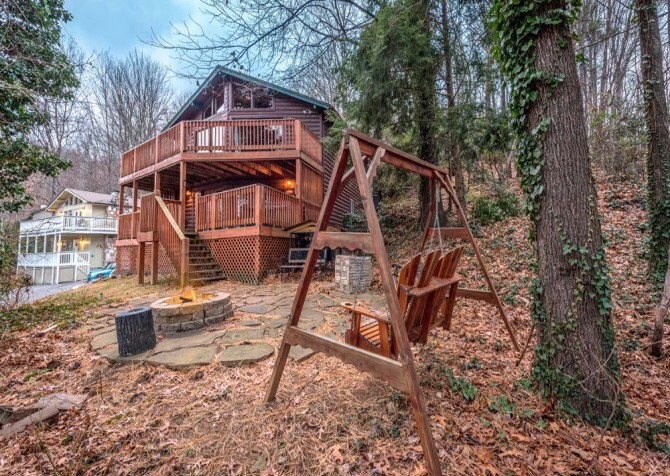 The name says it all at this cozy 1-bedroom cabin in Gatlinburg, Tennessee. 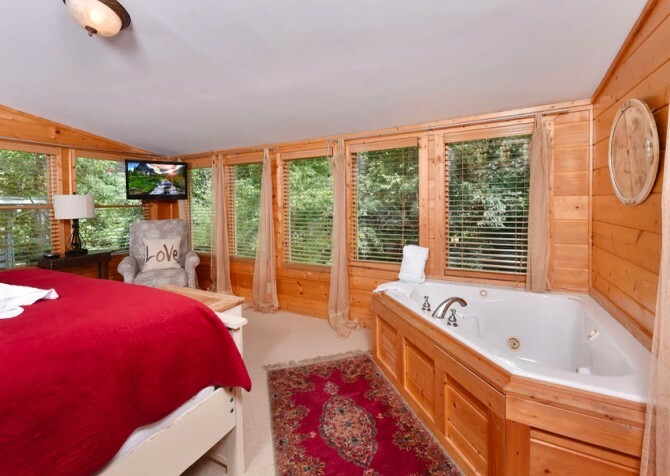 You'll find romance and relaxation here with an indoor jetted tub and sauna, DVD player and big screen TV, outdoor hot tub, and mountain views. 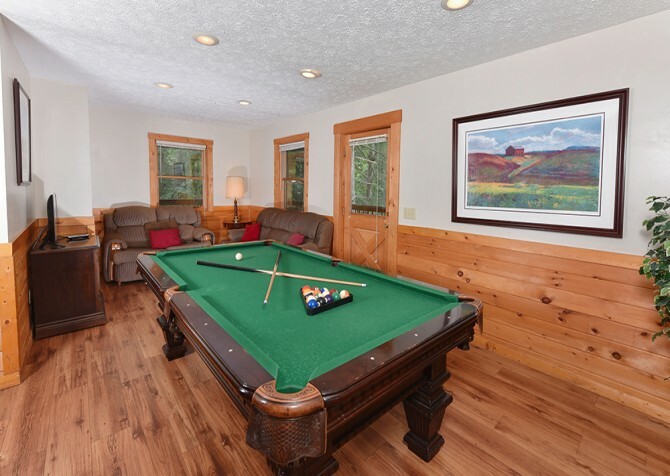 Also take advantage of pool access, access to tennis courts, the pool table, and the grill - all guaranteeing a fun time on your mountain getaway! Perfect for a honeymoon or romantic weekend away, Seclusion boasts luxurious furnishings and upscale amenities. A big screen TV hangs over the inviting fireplace, plush sofas offer a place to relax, and the queen-size canopy bed is beautiful. 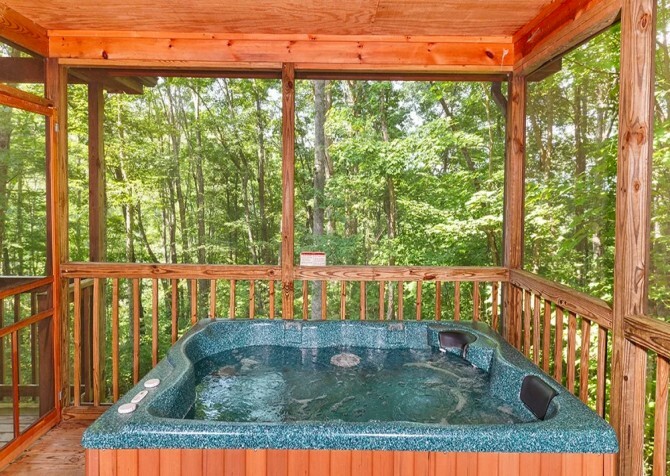 Pamper yourself with a soak in the indoor jetted tub or the outdoor hot tub before preparing meals in the kitchen or enjoying a drink on the deck as you take in the wooded views. 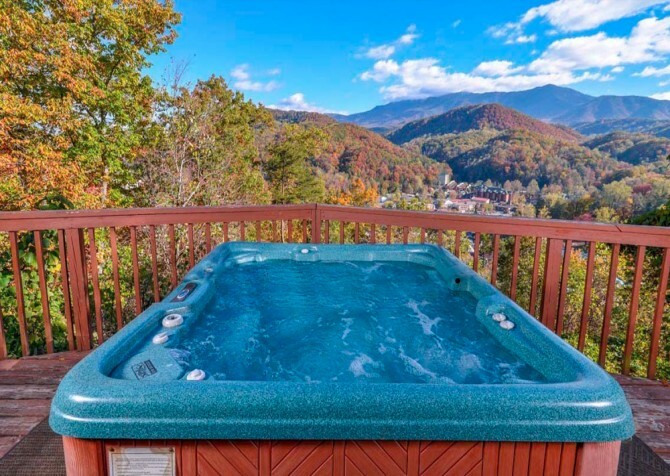 Located in the Cobbly Nob resort in Gatlinburg, Amy's Place is a comfortable 2-bedroom cabin offering community pool access. It provides room to sleep up to 6 guests, and it also boasts high-speed internet, an outdoor hot tub, and a gas fireplace. 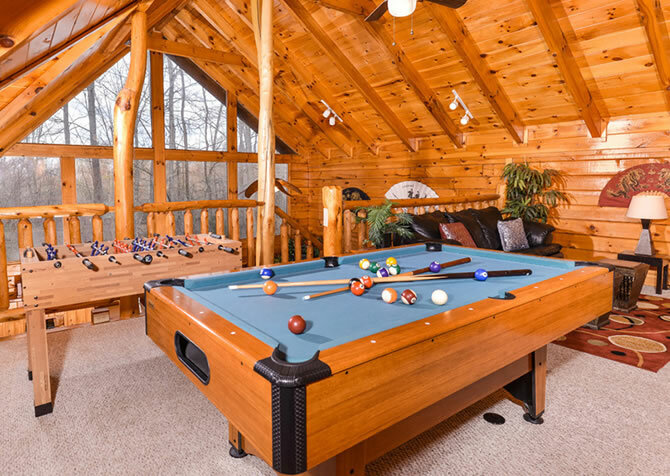 Whether you're traveling with adults or kids, everyone will love the game room with a pool table and air hockey table on laid-back days hanging out at the cabin. Honey Bear Heaven is located less than 4 miles from downtown Gatlinburg, perfectly situated in the arts and crafts district. That means easy access to attractions without sacrificing the peace of the Smoky Mountain woods that you crave. 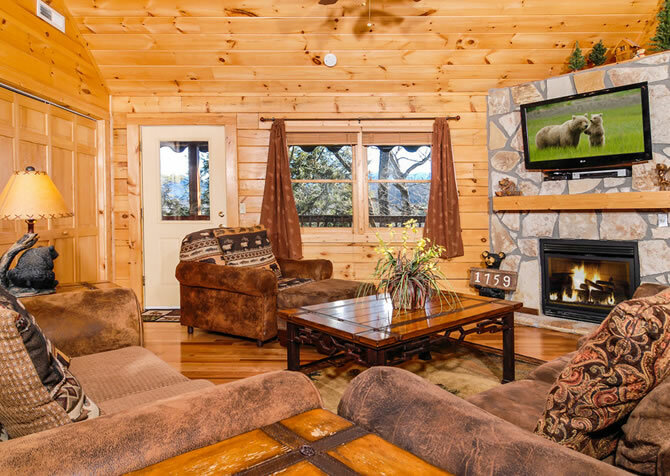 Enjoy a cozy living room when you want to unwind, a fully equipped kitchen for making in-cabin meals, wireless internet for planning out your days, and more. 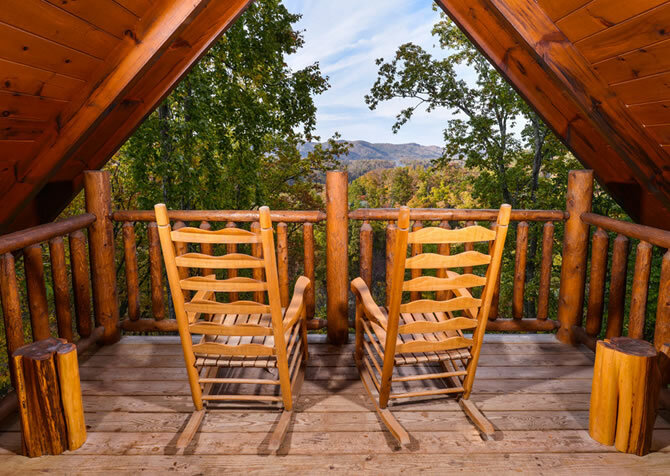 Tucked away into the Smoky Mountains but only a few miles from the superior dining, exciting attractions, and variety of shopping in downtown Gatlinburg, this 1-bedroom cabin for 2 is the perfect romantic escape for couples looking for the best of fun and relaxation. It boasts incredible mountain views, a queen-size bed, pool table, and lovely interior design. 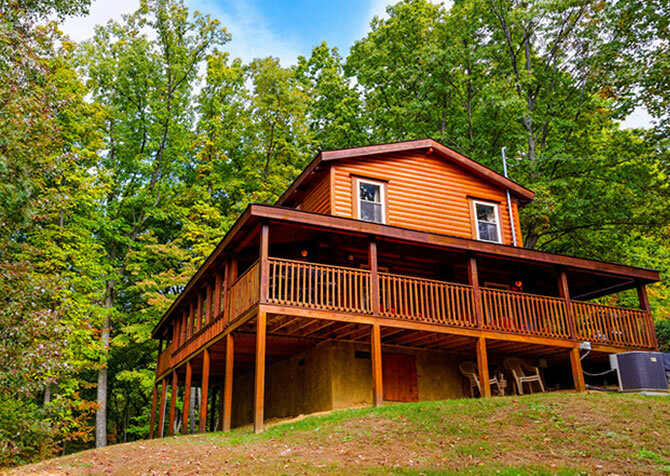 Offering convenience and comfort, this 2-bedroom Pigeon Forge cabin is just minutes from downtown and features an outdoor hot tub, a TV in the bedroom, a gas fireplace, mountain views, and high-speed internet. The king-size log canopy bed is a romantic touch, and the fully-equipped kitchen provides a great space for preparing a romantic candlelit dinner for a date night in the cabin. A cozy Chalet Village cabin with room to sleep up to 6 guests, Alpine Serenity can accommodate a group of friends or a small family. 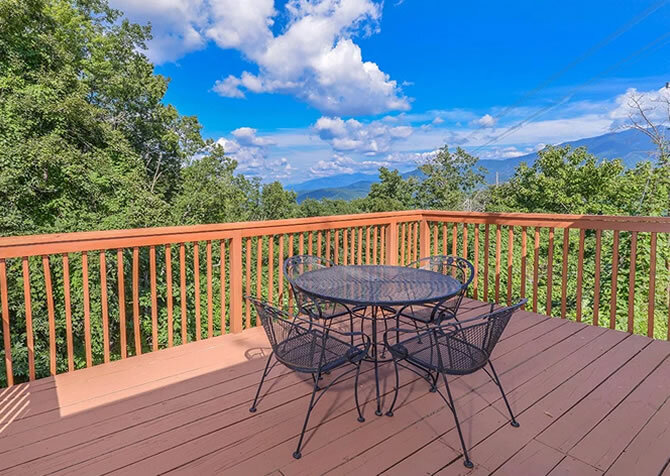 Its location just 2 miles from downtown will keep guests near all the action, while its semi-private placement in the Smokies will offer guests a peaceful retreat. 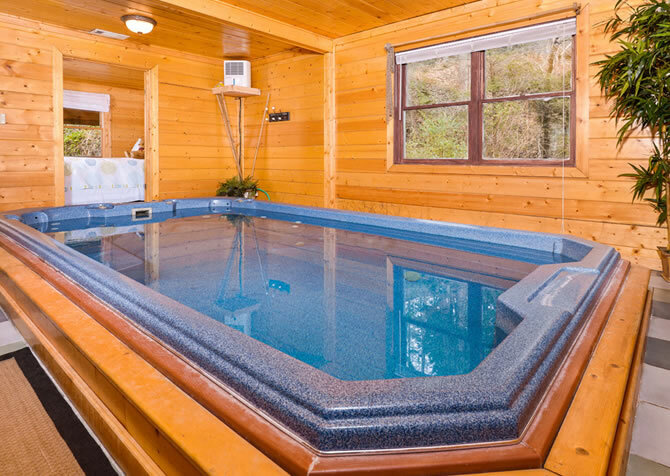 Alpine Serenity also boasts a hot tub, indoor jetted tub, sauna, and pool table! 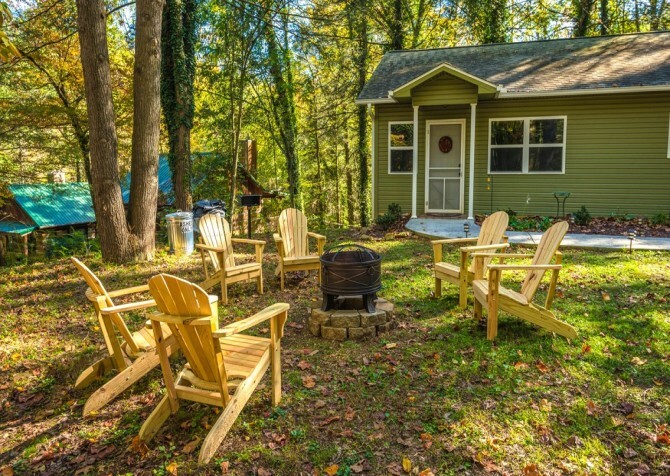 Located in the heart of Gatlinburg, Red Bud Cottage gives you the cabin experience without straying too far from city life. After all the fun outdoors, head inside the cabin for a doze on the king-size bed, a hot shower in the en-suite bathroom, and a late-night show on the big screen TV. Or grab some marshmallows and roast them over the fire pit just outside. This charming 1-bedroom has it all, from a fully equipped kitchen for family meals and a king-size bed to a private indoor pool and a rec room with a pool table and arcade game! 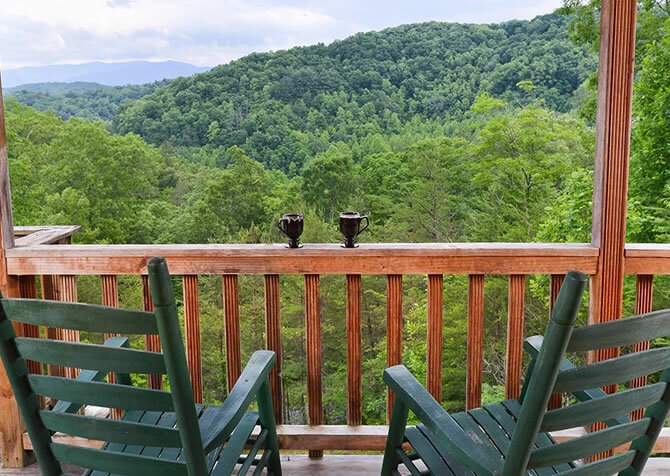 Relax as you enjoy the wooded views and mountain breezes, or play at the cabin after a fun day eating, shopping, and exploring in downtown Gatlinburg and the Great Smoky Mountains National Park! 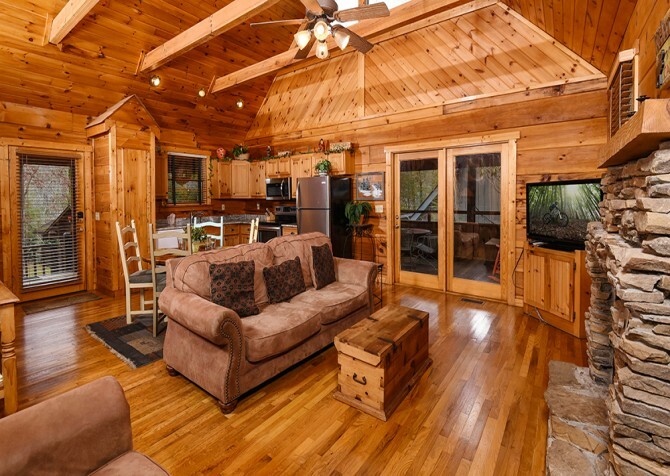 Just a short drive from downtown Gatlinburg, this pet-friendly cabin boasts comfort and fun. The bedrooms have king-size beds and TVs, and the shared living spaces are comfy places for groups to relax. 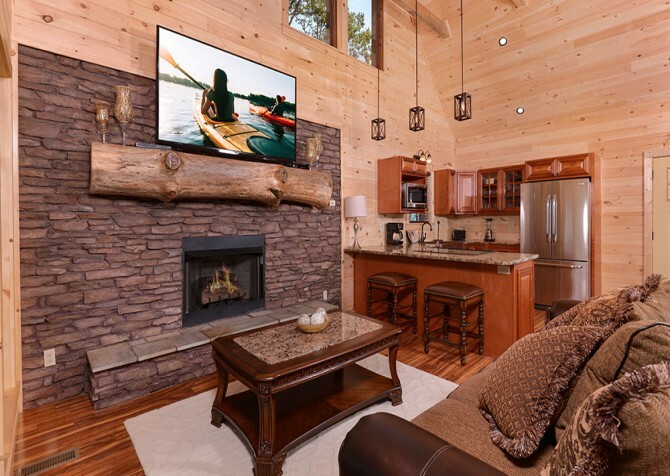 Bearfoot Lodge also boasts high-speed wireless, surround sound, a washer and dryer, fireplaces, an outdoor fire pit, a charcoal grill, a fully-equipped kitchen, and much more! 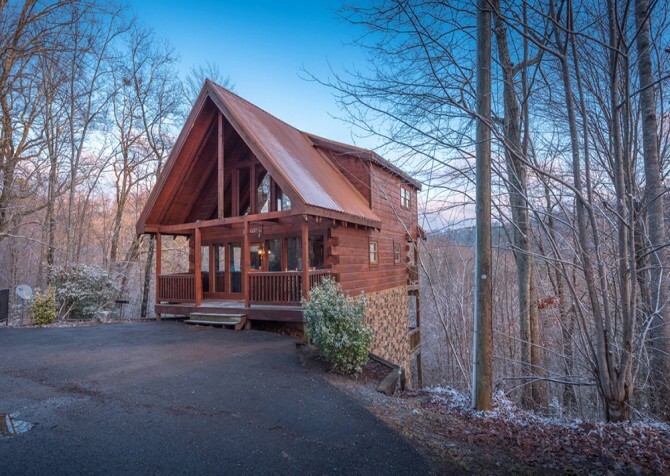 Outdoor enthusiasts will absolutely love this 3 bedroom, 2 ½ bathroom cabin located just outside the Great Smoky Mountains National Park. 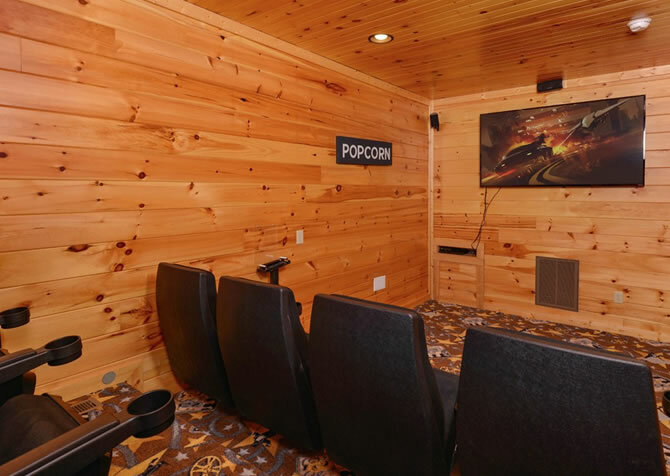 Visit the 90-foot waterfall, Hen Wallow Falls, just down the road, or head back to the cabin to play ping pong, watch shows on the big screen TV, or stay warm by the gas fireplace. More outdoor fun can be found in the spacious yard, by the quiet stream! 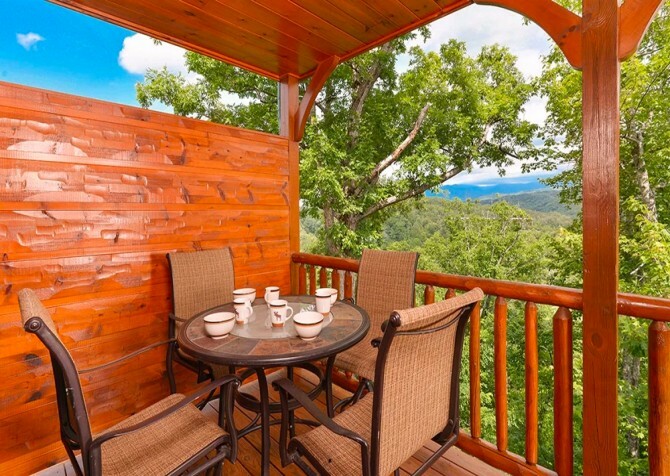 Call this 2-bedroom cabin your home away from home in Pigeon Forge, Tennessee. Feel the outside world drift away when you stay in this charming cabin rental. 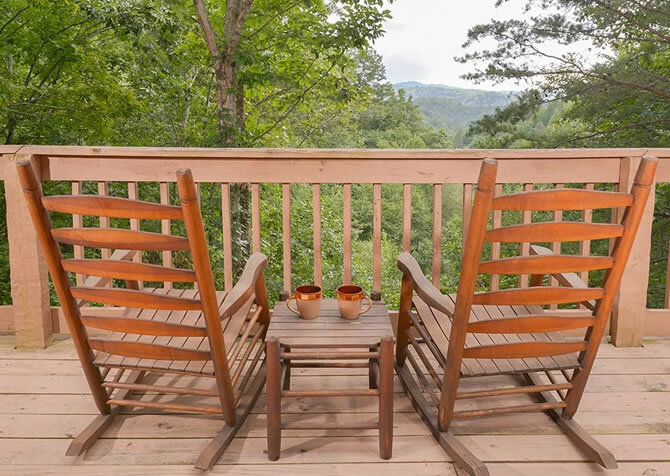 Pool access and wireless internet offer ways to pass the time, and a wraparound porch invites you to spend some time surrounded by the forest of the Smoky Mountains while you sip a drink, read, chat, and unwind. 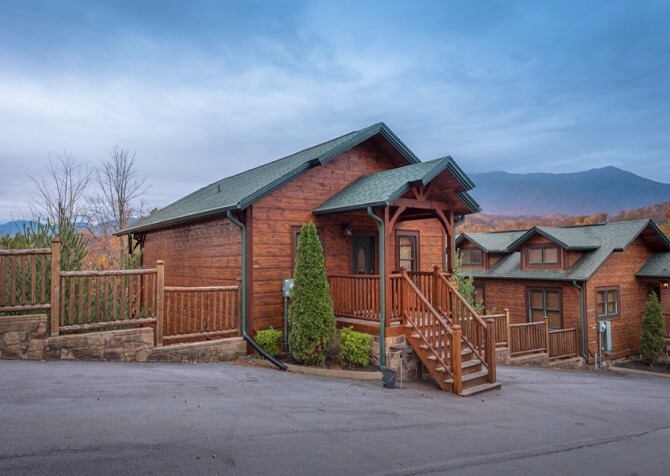 Perfectly situated between Gatlinburg and Pigeon Forge, this 1-bedroom, 1-bathroom, studio-style cabin is ideally located near the attractions, stores and restaurants of these 2 mountain towns. Amenities such as a hot tub, gas fireplace, charcoal grill, and full kitchen make this cabin feel like home. Get away at this charming (and pet friendly!) Smoky Mountain cabin. 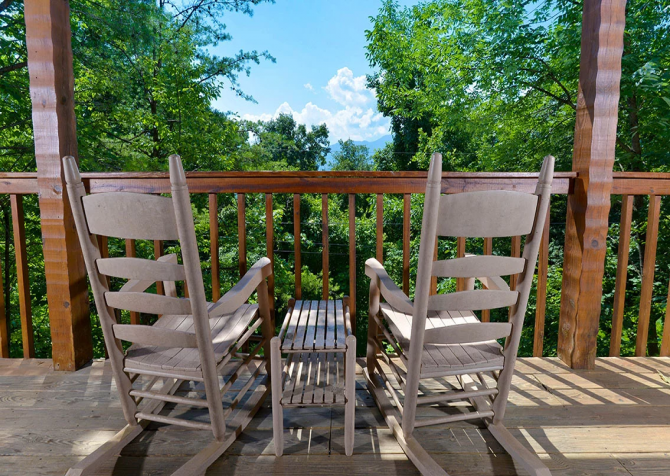 Conveniently located near the beautiful Gatlinburg, Tennessee, guests will enjoy peaceful mountain views, impressive interior design, and lovely amenities like rocking chairs, outdoor hot tub, and a stacked-stone fireplace at Cozy Cabin. 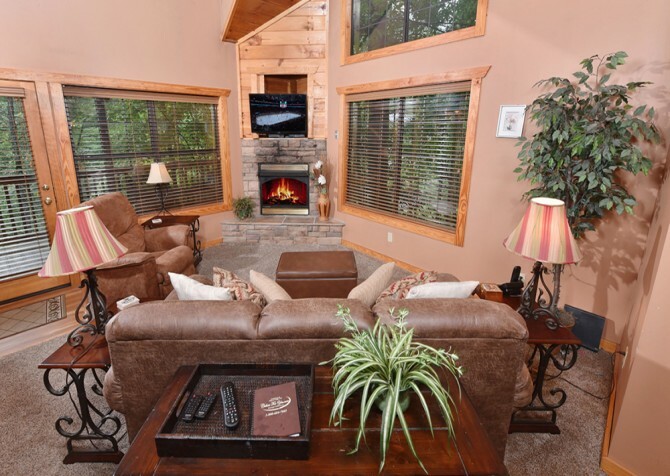 Feel at home in this cozy 2-bedroom, 1-bathroom cabin rental in the Mountain Shadows Resort in Gatlinburg, Tennessee. A couple's retreat will be perfect with the 2 master suites, beautiful living area with flatscreen TV, fully-equipped kitchen, and screened-in deck. Other conveniences include paved parking, pool access, TVs in the bedrooms, a washer/dryer, and more - everything you need to feel at home! 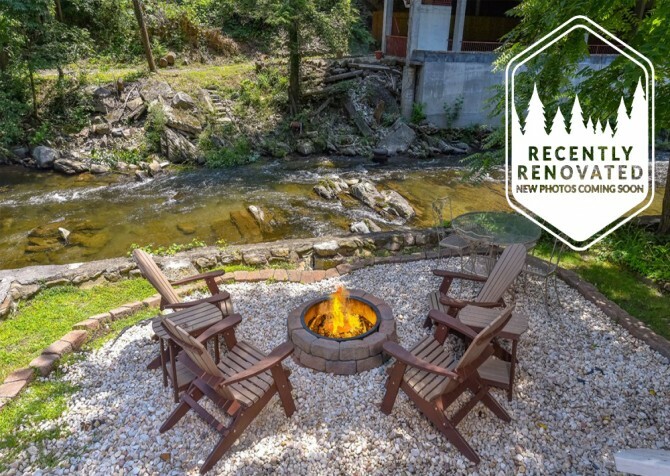 Overlooking the Little Pigeon River, On the River is a 1-bedroom, 1-bathroom, pet-friendly cabin for 2 that’s perfect for romantic getaways in Gatlinburg. Less than 1 mile from town, this charming abode boasts a convenient location, a screened-in deck with a hot tub and rocking chairs, a king-size bed, big screen TV, a fully equipped kitchen, and more! Get away for romance and relaxation at Sweet Temptations. 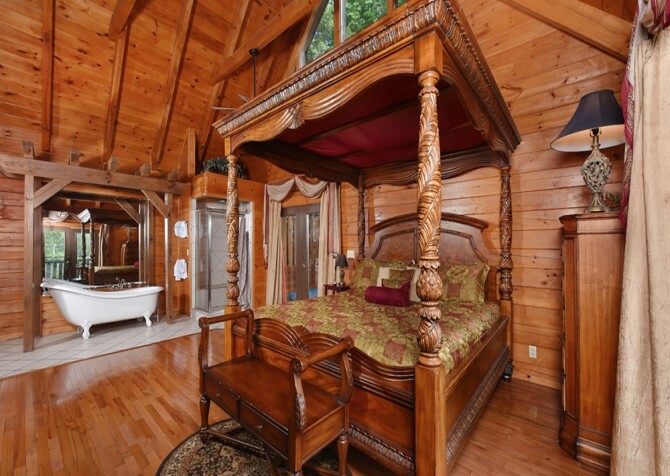 This 1-bedroom, 1-bathroom Gatlinburg rental features a queen-size bed, a TV in the bedroom, and room for up to 4 guests. Spend evenings in the rocking chairs or the hot tub on the deck, watch your favorite shows on the big screen TV, play pool and foosball, or take the short drive into town to check out area attractions. 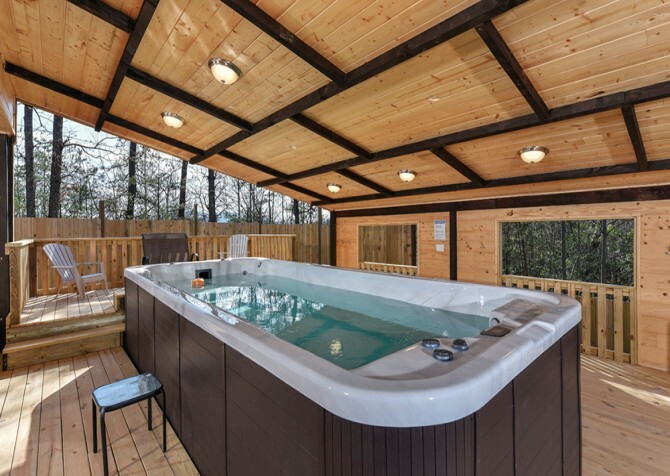 This lovely Gatlinburg cabin boasts pool access and a private outdoor hot tub where you can relax and unwind any time of year. 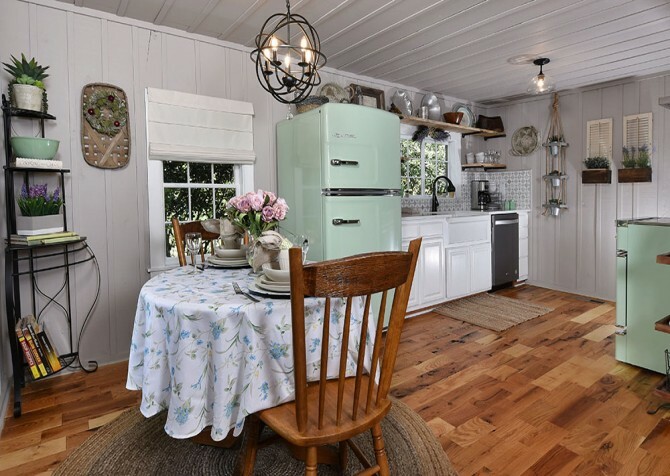 Those keeping up with work will love the wireless internet and deck furniture this 2-bedroom cabin has to offer. 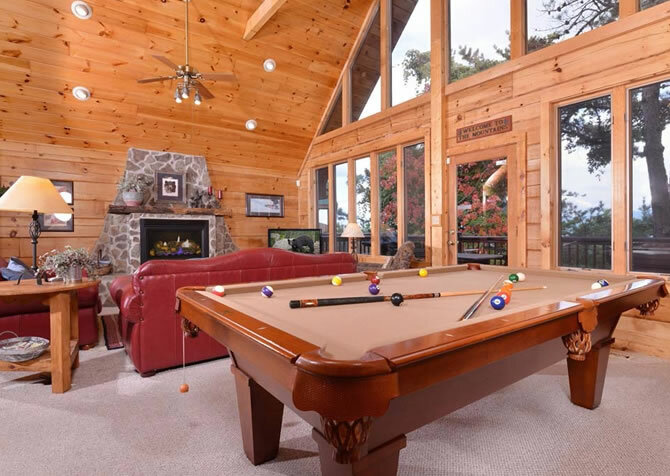 Play on the pool table or enjoy your view from the glass and beam wall in the living area before heading into town to shop, grab a bite to eat, or explore fun Gatlinburg attractions! In the Gatlinburg Falls Hidden Valley Resort, the stunning 7-bedroom Cherokee Dreams Lodge is impressive inside and out! 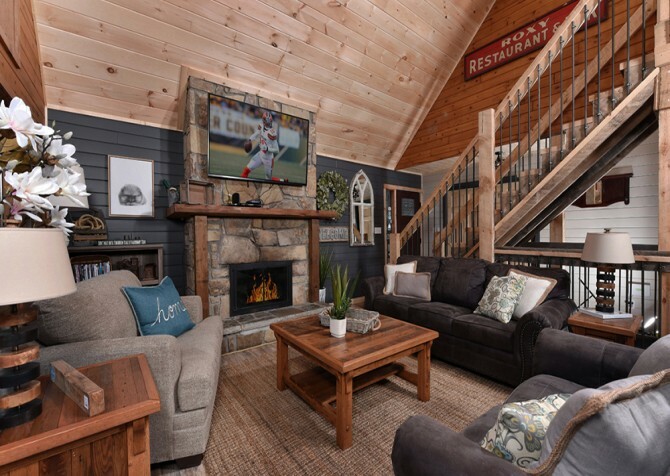 Relax on 3 spacious decks, soak in hot tubs with TVs, enjoy luxurious spaces throughout, and play games in the 2 awesome rec rooms that will impress both kids and adults! 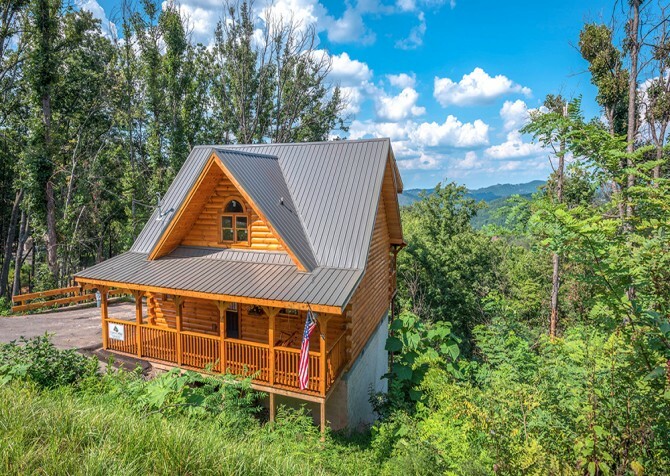 Conveniently located between Pigeon Forge and Gatlinburg, this 1-bedroom, 2-bathroom cabin with a loft is perfect for a couples' retreat or a family getaway. Though close to all the great restaurants, shops, and attractions of the city, the wooded views will keep you feeling at peace in the mountains. Enjoy a relaxing hot tub and porch swing outside and a jetted tub and a gas fireplace inside. 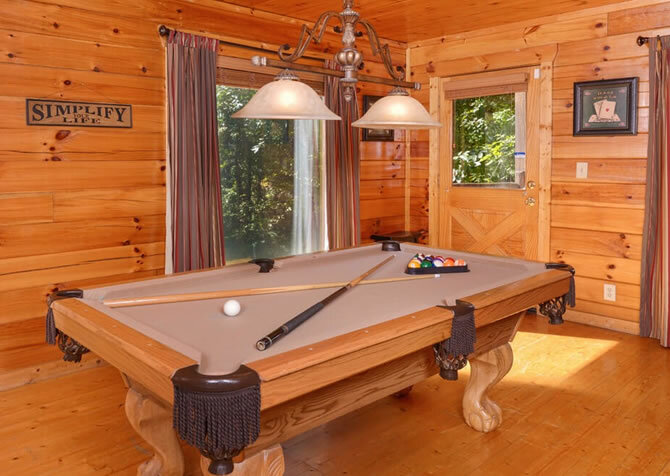 A memorable vacation awaits at Unforgettable, a pet-friendly cabin in a peaceful location near downtown Gatlinburg. 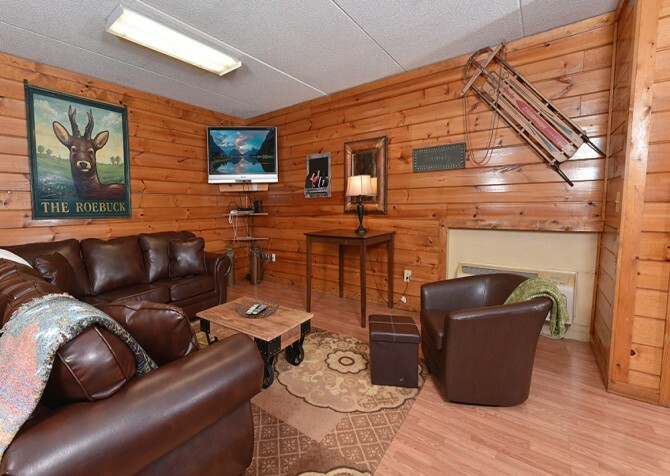 With the feel of home, this cabin offers incredible amenities and comfortable furnishings. 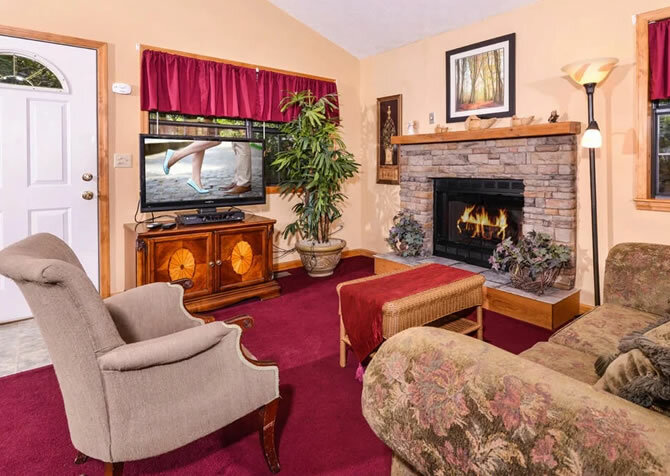 You'll love the big screen TV, rec room filled with games, large fireplace, antler chandelier, fully equipped kitchen, outdoor hot tub, high-speed internet, and charming décor at Christmas! 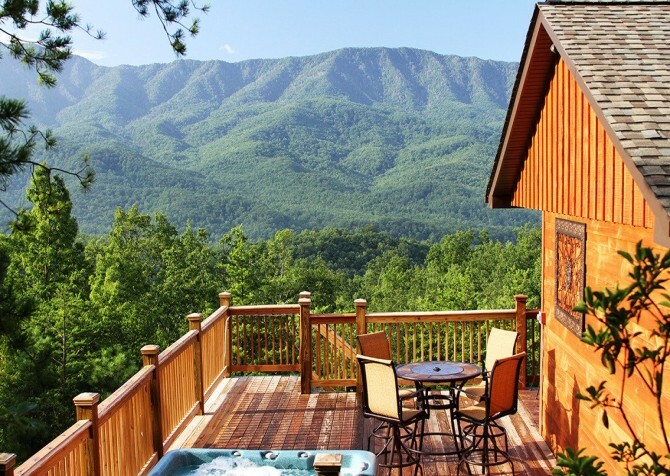 Get away to The Tree House, tucked beneath the Smoky Mountain trees in Gatlinburg, TN! This cabin for 4 features a king master suite with a jetted tub, a soothing outdoor hot tub, a big screen TV in the living room, and 2 wood-burning fireplaces. 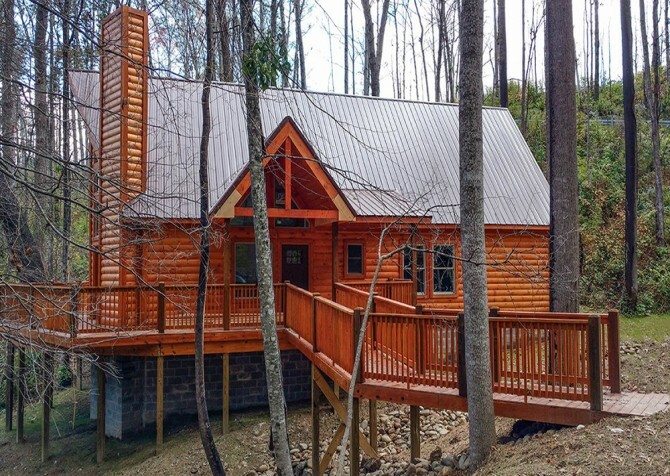 With the peace of the Smokies all around, this pet-friendly cabin is perfect for romantic retreats or small family vacays. 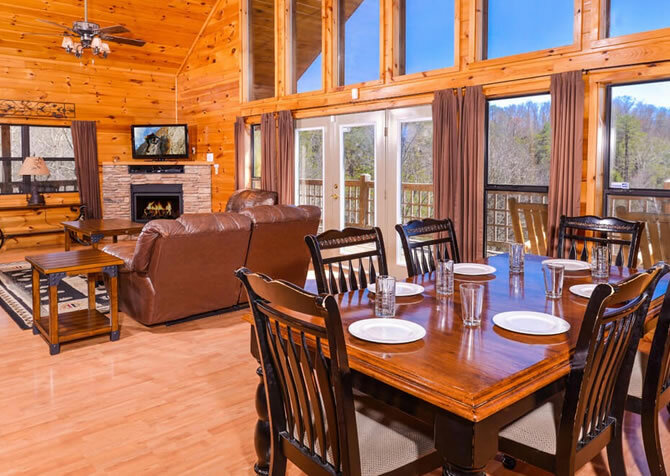 Only a 10-mile drive from Gatlinburg and Pigeon Forge — you’ll have access to all things Smoky Mountains when you stay at Bearfoot Landing, a large-group cabin for 24 in Gatlinburg! 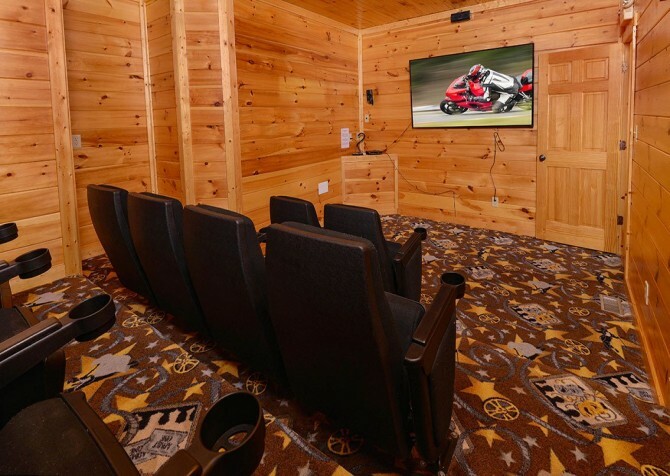 Play in town all day, then return to the cabin for foosball and pool in the rec room, hot tub soaks with mountain views, feature films on the big screen TV, and snuggles in one of 5 king-size beds. Not far from the fun of downtown Gatlinburg, Bearskin Lodge makes it easy to explore the area. 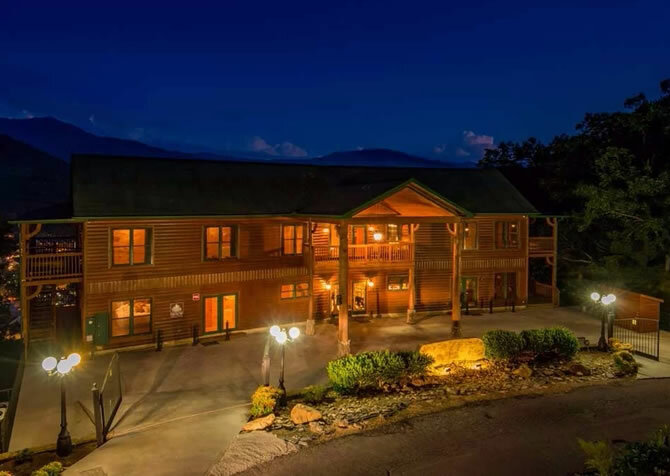 Play in the Great Smoky Mountains National Park, check out attractions, and then head back to this awesome group lodge to play air hockey and pinball, soak in the hot tubs, or make meals for the group in the kitchen with double appliances. 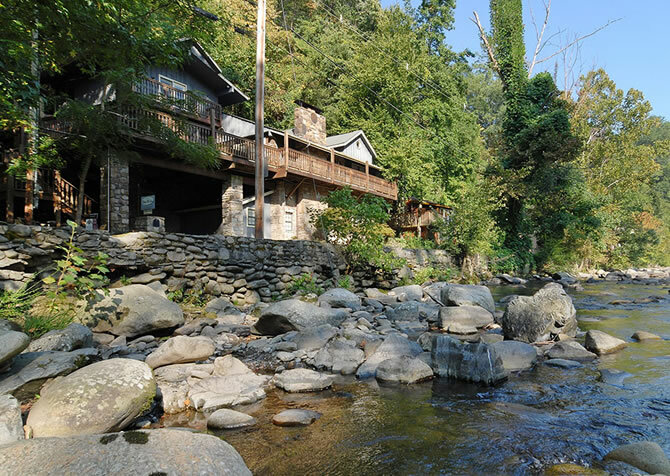 Within walking distance to town, A River Song is a Gatlinburg cabin rental for 10 on the Little Pigeon River! Featuring 3 bedrooms, 4 full bathrooms, 3 gas fireplaces, multiple flatscreen TVs, a spacious kitchen, a handy kitchenette, a fun rec room, and a deck with outdoor dining and a hot tub, this riverfront cabin is great for family vacations or getaways with friends. 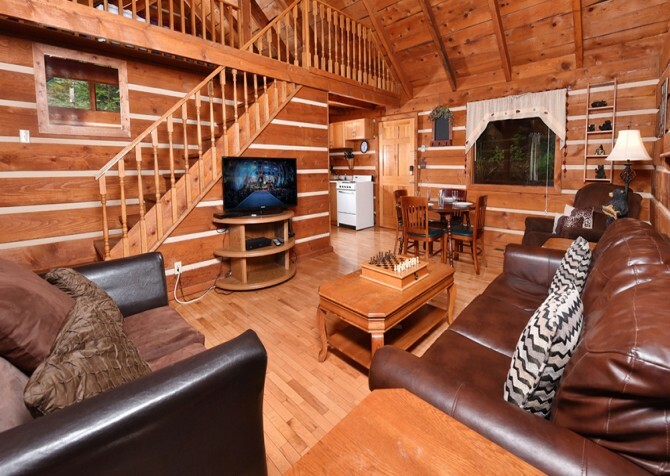 Only a short drive from the restaurants, shops, and attractions of the Gatlinburg Parkway, this 2-bedroom cabin accommodates up to 8 guests. 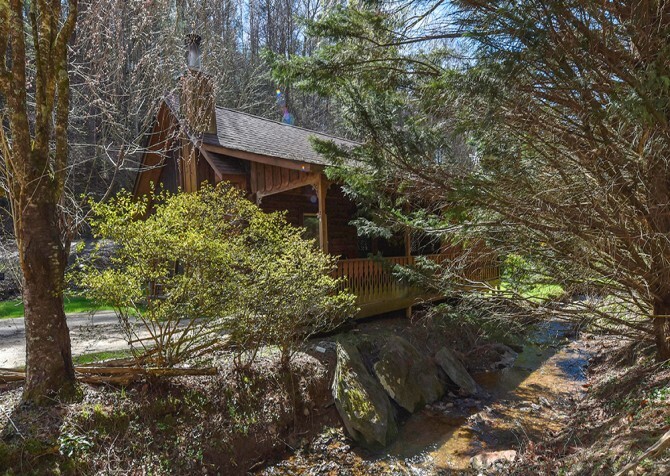 Featuring a semi-private location and offering pool access, this cabin is also located close to the Great Smoky Arts and Crafts Community. 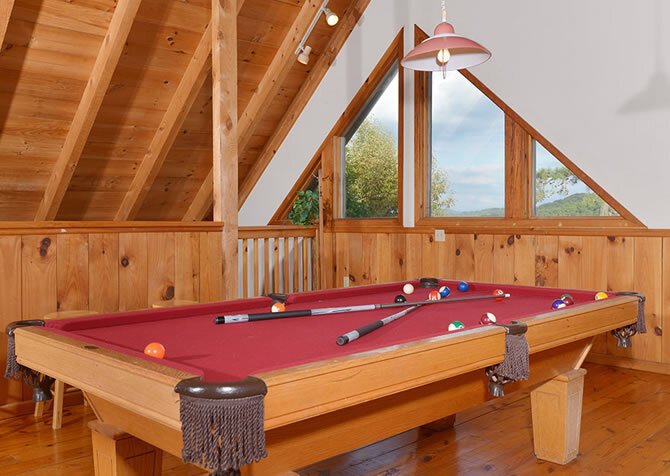 With a pool table, wireless internet, vaulted ceilings and more, you will appreciate the homey feel of this cabin rental. 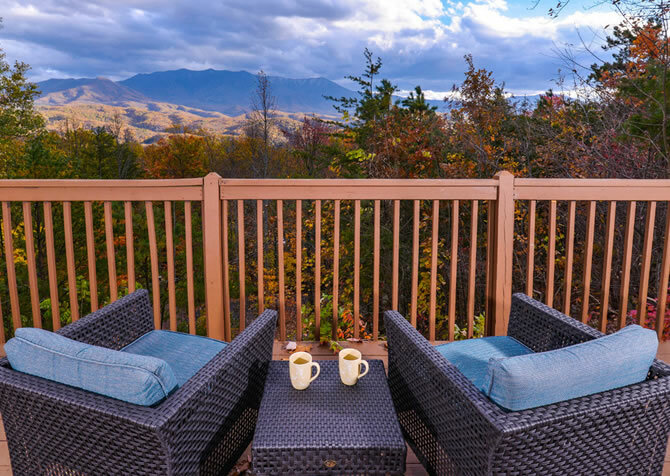 Just a short drive from Gatlinburg and Pigeon Forge, Tree Tops is nestled high atop the Smokies, offering beautiful mountain views. Guests will enjoy the pool table, dart board, charcoal grill, outdoor hot tub, indoor jetted tub, 3 flatscreen TVs, and high-speed internet. Providing a space that feels like home, Tree Tops features a washer and dryer, a fully-equipped kitchen, and a gas fireplace. 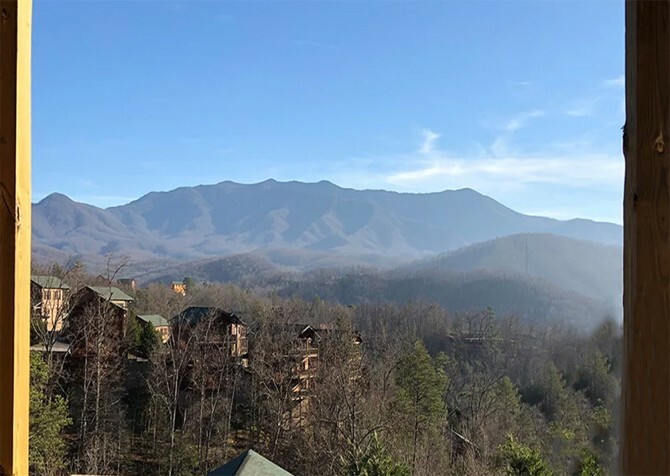 Looking for a Smoky Mountain retreat that offers spectacular views with less than a 5-mile drive to downtown Gatlinburg? Check out A Wildflower Retreat! 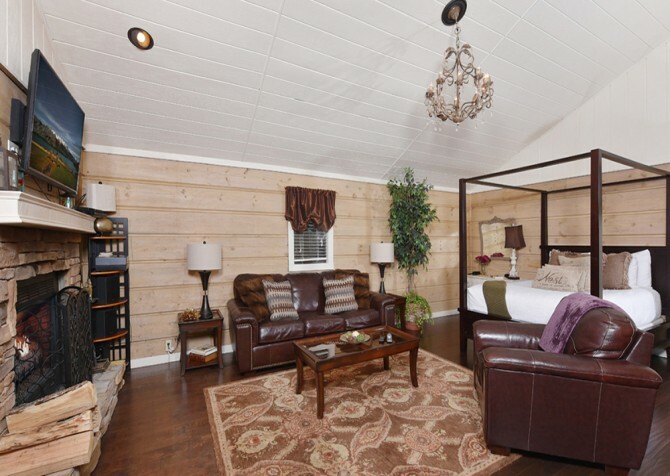 This Gatlinburg cabin features 1 bedroom and 1.5 bathrooms with bonus sleeping accommodations for up to 8 guests. Bring family and friends for a fun stay with a 7-person hot tub, pool table, and 2 big screen TVs! 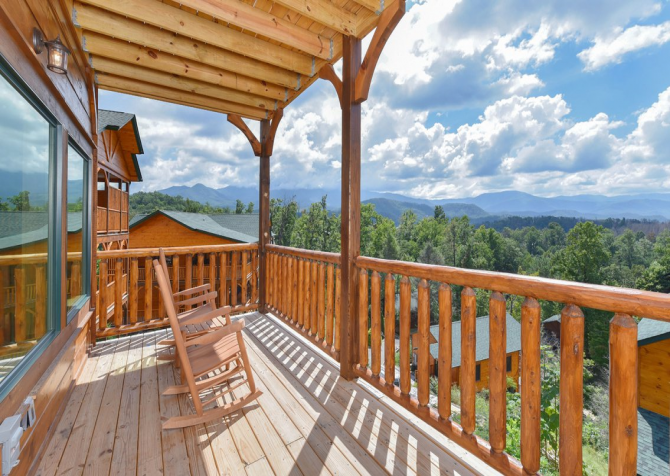 Enjoy a peaceful escape to the Smokies at this 1-bedroom, 1-bathroom cabin in the Sky Harbor Resort. Kids and adults will love the pool and foosball tables, and couples will love nights watching TV from the queen-size bed in the bedroom. There's a queen sleeper sofa for additional guests, and a big screen smart TV is perfect for ball games and movies. It's a relaxing and comfortable escape! 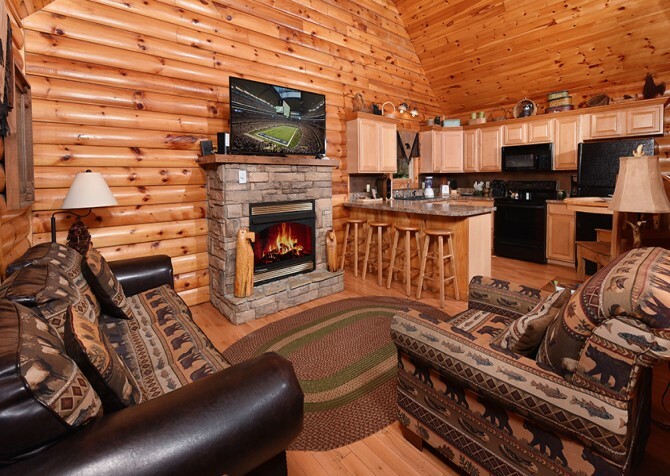 Make Auntie Sue’s Cabin your vacation home in Pigeon Forge, TN! 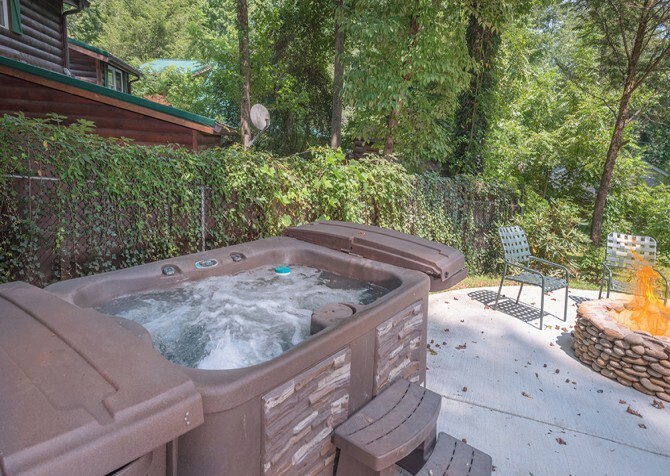 Soak in the outdoor hot tub with wooded views all around, watch comedy classics on the flatscreen TV, and doze off in the cozy queen-size bed. Don’t forget to head to downtown Gatlinburg or Pigeon Forge, each mere miles away, for more fun at area attractions, shops, and restaurants! Just a few miles from downtown Gatlinburg, Lasting Impressions keeps you close to all the attractions, shops, and restaurants. 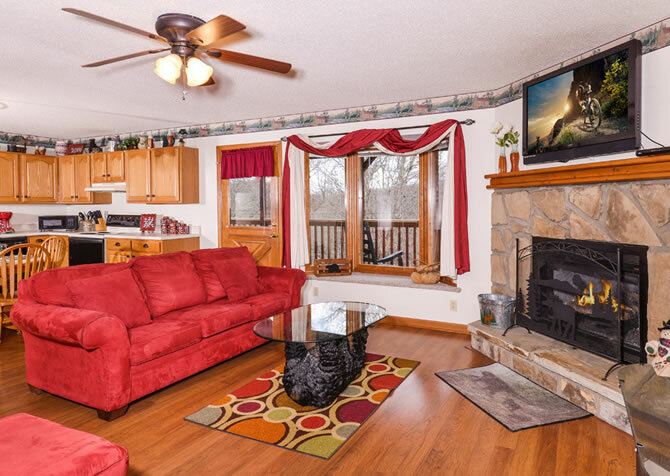 Spend the afternoon in town, and then head back to this comfortable 1-bedroom cabin to relax. You'll find a cozy king-size bed, a TV and gas fireplace in the inviting living room, a fully-equipped kitchen, an outdoor hot tub, an indoor jetted tub, and more! 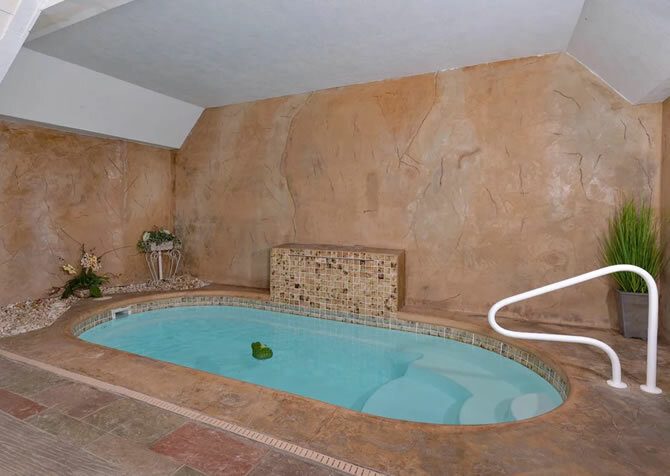 Located along Little Pigeon River and offering a swim spa – what more could you ask for? 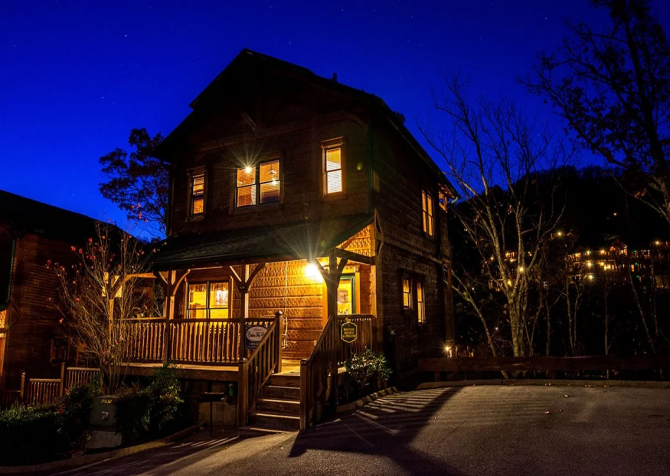 This 1-bedroom pet-friendly Gatlinburg cabin boasts a heated swim spa and is walking distance to the downtown strip. 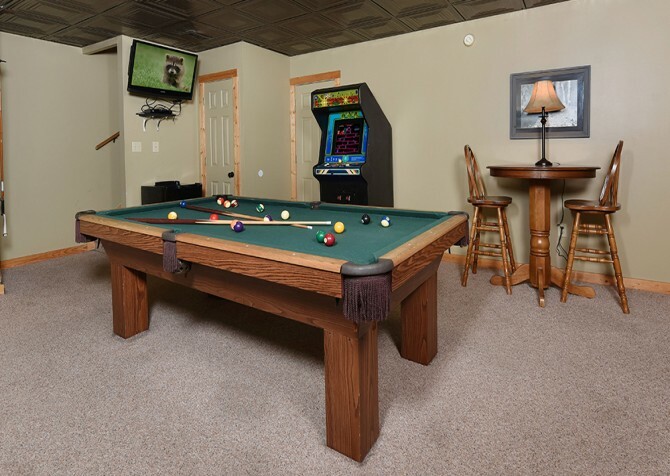 Listen to the flowing river as you lounge in front of the flatscreen TV on a laid-back day in the cabin or play pool after a day spent shopping, eating, and playing downtown. Located just minutes from downtown Gatlinburg and Ober Gatlinburg, Alpine Air offers the serenity of the mountains plus the fun of area attractions, shopping, and restaurants. 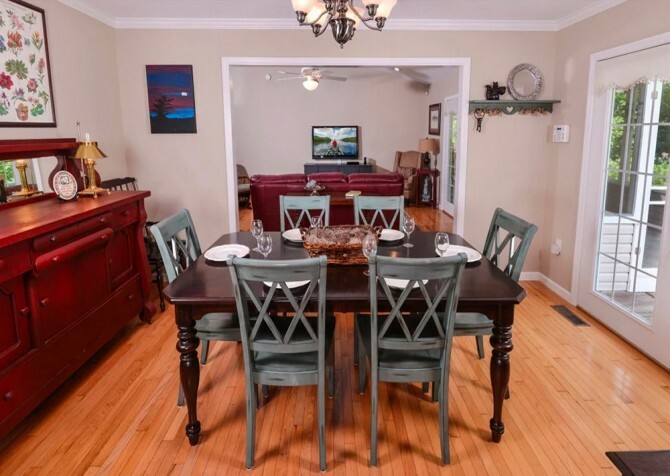 All 3 bedrooms have king-size beds and flatscreen TVs, and shared spaces include a cozy living area, a deck with a hot tub and rocking chairs, and a game room with plenty of entertainment for kids and kids at heart. Boasting 2 kitchens, 2 spacious living areas, a big screen TV, a game room, and 6 comfortable bedrooms, Pop-a-Bear is ideal for big family vacations or group getaways. It has 6 1/2 bathrooms, a gazebo area with 8-person hot tub and picnic table, a basketball goal, and the comforts you expect from home in the style of a cozy mountain getaway! Sleeping up to 12 guests comfortably, this 4-bedroom (plus loft), 3-bathroom cabin boasts 3 covered decks! Pool access, a pool table, high-speed internet, and a big screen TV are just a few of the perks here. 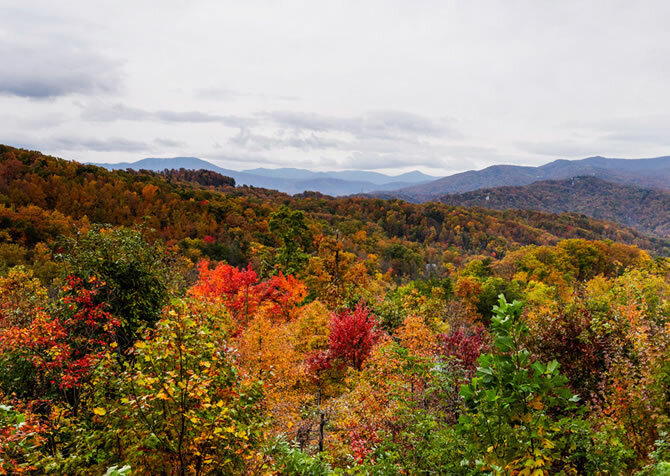 Our Mountain Home is also less than 5 miles from downtown Gatlinburg – ideal for guests wanting to see the attractions or the Great Smoky Mountains National Park! A beautiful three-bedroom, 3--bathroom cabin with room for 8, Mountain View Lodge offers entertainment and great spaces to relax. Rest in a cozy bed, splash around at the community pool, or prepare meals in the fully equipped kitchen with stainless steel appliances. 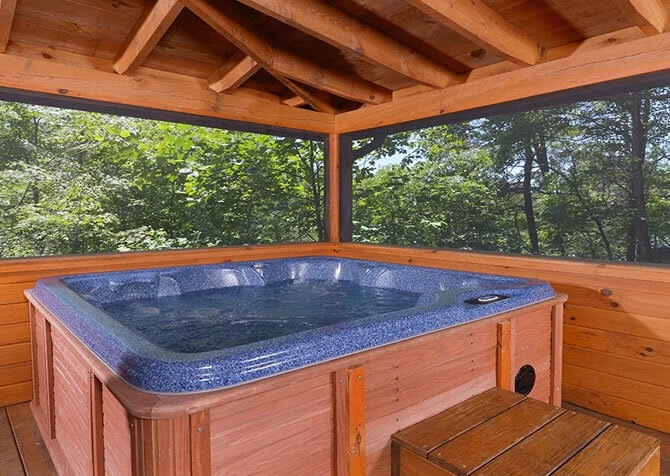 The hot tub is tucked away behind a privacy screen, and the wooded views outside are truly peaceful. After days of rollercoasters in Dollywood in Pigeon Forge, an easy drive under 10 miles away, kick back and relax in the reclining patio furniture on the expansive back deck, play cards around the tables of the sunroom, or watch movies from the cozy couches on the flatscreen TV in the living room in this relaxing Gatlinburg cabin large enough for 12 guests. 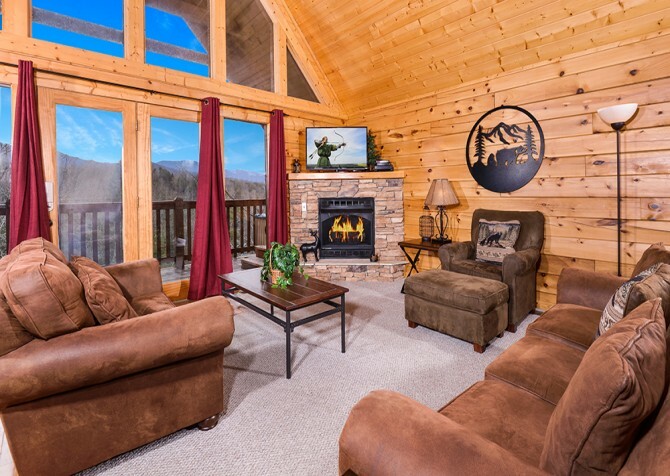 Just a short drive from downtown Gatlinburg, Nature's Splendor is a cozy 1-bedroom, 1-story cabin rental with lots of amenities. It offers a 37-inch flatscreen TV for unwinding in the cabin, high-speed wireless internet for staying connected, a gas fireplace, and a soothing hot tub. The living room will feel like home, and screened-in hot tub can be enjoyed year-round. 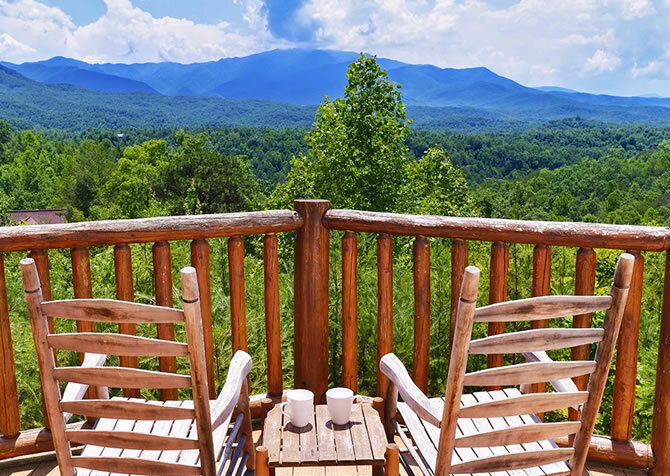 Retreat to a secluded Smoky Mountain cabin that still boasts a short drive to the attractions of Gatlinburg and Pigeon Forge. 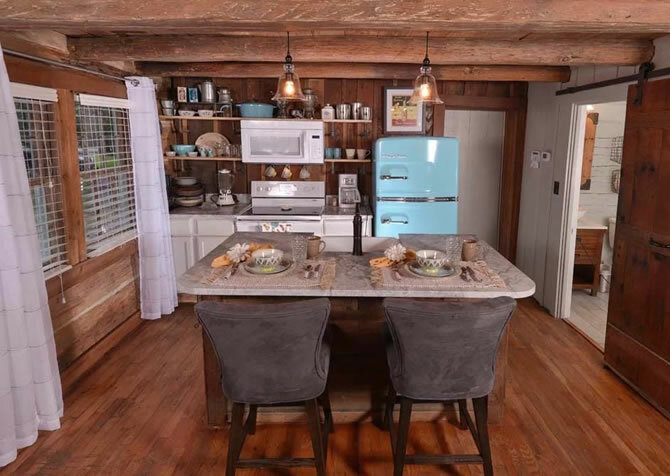 The rustic 2-bedroom getaway features cozy interiors, an inviting country kitchen for making in-cabin meals, foosball and air hockey for hours of entertainment, and lots of conveniences to make you feel right at home. 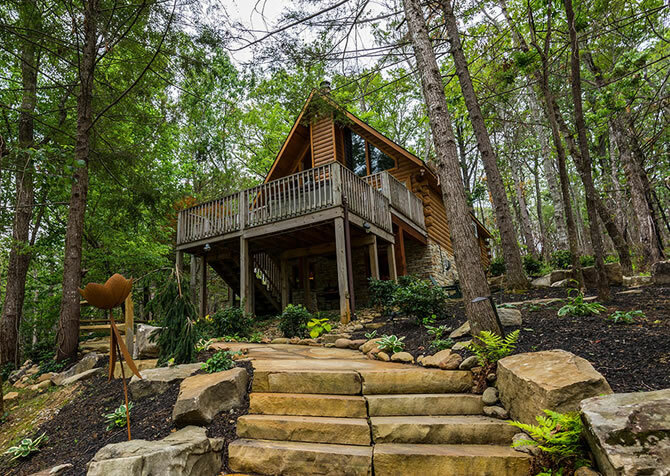 Less than 1 mile to the center of Gatlinburg, Quiet Time is a choice cabin for those wishing to stick close to city attractions yet reconnect with nature. 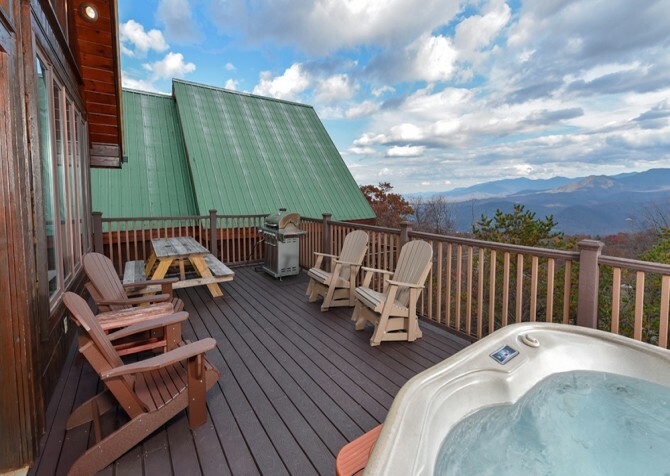 Woodsy views, an outdoor hot tub, a big screen TV, board games in the lounge, a s’mores-perfect firepit, king-size beds, and an indoor jetted tub await at this 3-bedroom, 2-bathroom cabin in the Smokies! 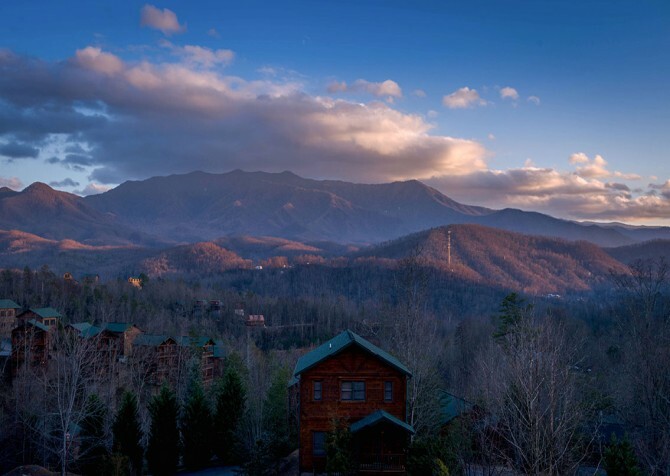 Nestled between Gatlinburg and Pigeon Forge, Think a Little Less keeps guests close to famed attractions, such as Ober Gatlinburg, Dollywood, and the most-visited national park! 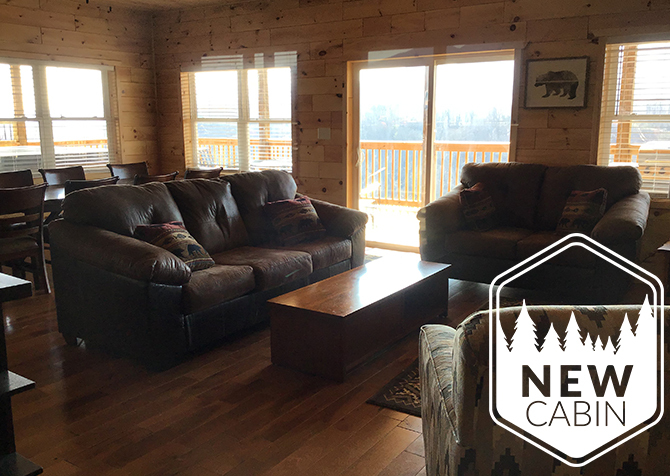 After adventures in town, head back to the cabin for hot tub soaks, movies on the big screen TV, games in the rec room, and sweet dreams in a king-size bed at this 1-bedroom +loft cabin! 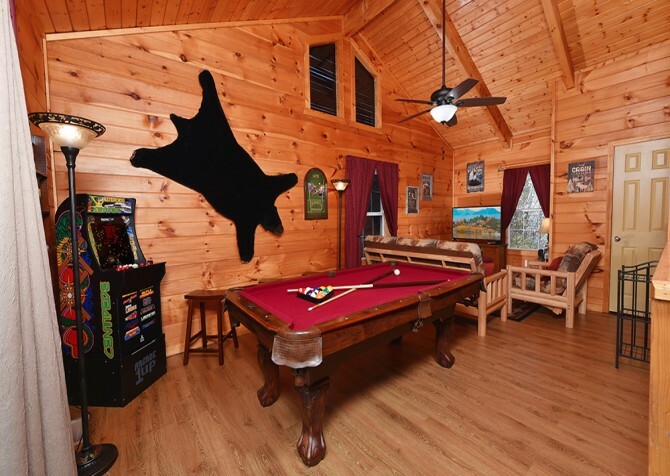 Around 8 miles to Gatlinburg attractions, restaurants, and shops, A Bear’s Eye View is a 3-bedroom, 3.5-bathroom cabin for up to 10 guests, perfect for those wanting to experience the Smokies without a too distant drive to local fun. Play air hockey, pool, and foosball in the rec area, watch movies on the big screen TV, soak in the outdoor hot tub, and snooze in king-size beds. 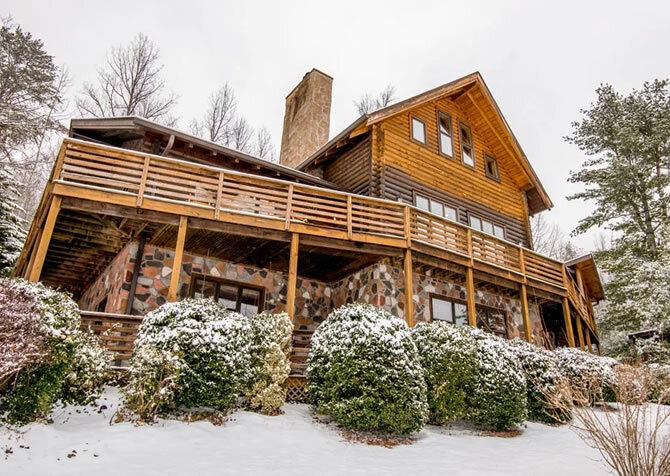 Located in Gatlinburg, Tennessee, Queen’s Log Cabin provides a relaxing retreat with 3 bedrooms, 3 bathrooms, tree-studded views, and bonus amenities galore! 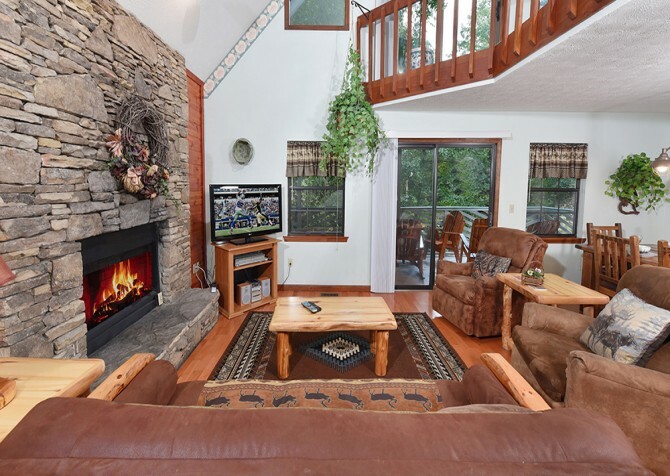 Spend time in the city and head back to the cabin for barbecue parties on the back deck, soaks in the hot tub, games in the rec room, snuggles in a king-size bed, family chats by the fire, and movie nights on a flatscreen TV. Offering the best of both worlds, Bearadise boasts a location about 1 mile from downtown while still being situated peacefully among the trees. It’s near the fun attractions, restaurants, and shops of downtown, so it’s easy to explore and play. Then you’ll have a comfortable, beautiful place - including a beautifully landscaped welcome - to call home at the end of the day. Romantic and close to downtown Gatlinburg, this 1-bedroom, 1-bathroom cabin is perfect for a honeymoon, anniversary, or romantic escape. 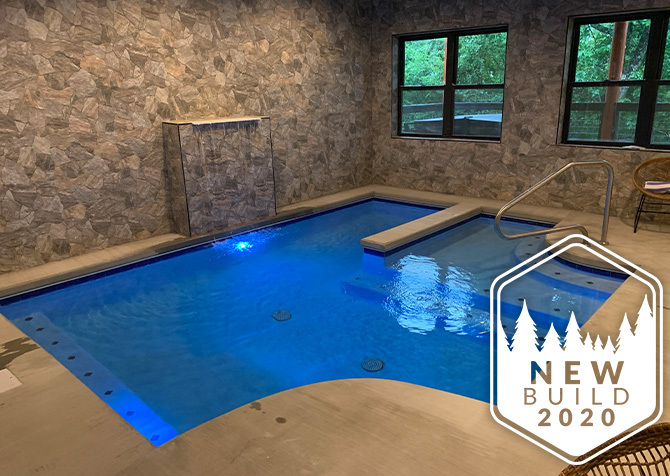 Along with pool access, enjoy the sunken hot tub on the private deck, the luxurious claw-foot tub, a double-sided gas fireplace that faces the bedroom and the living room, and a gorgeous wood canopy bed. Take in the views from this homey cabin in the woods. 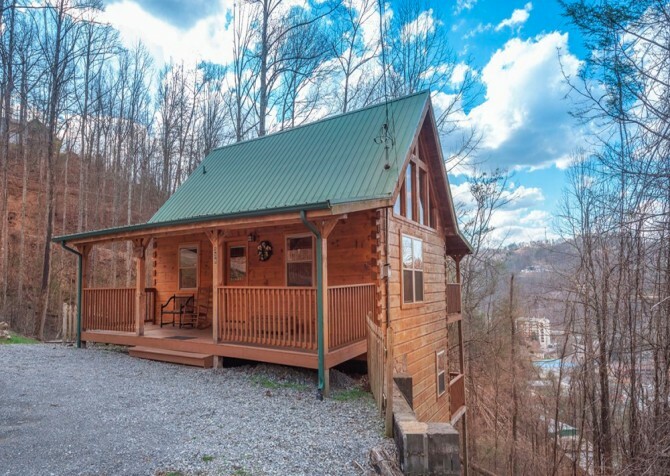 Conveniently located just 4 miles from downtown Gatlinburg, this 1-bedroom, 1-bathroom cabin is cozy and homey. 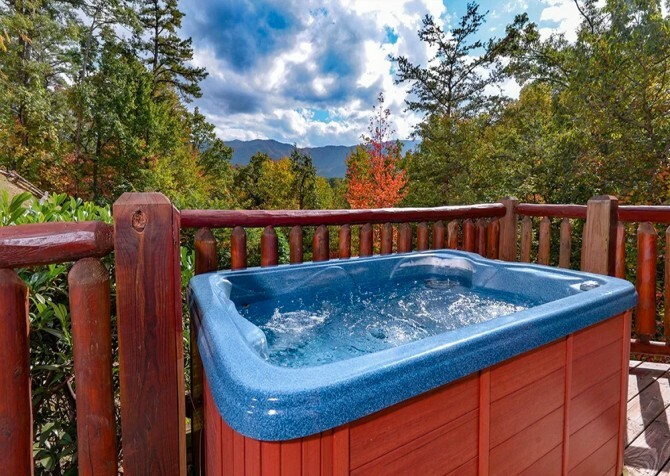 For an anniversary, honeymoon, or quick weekend away, Kandy Kisses offers a relaxing outdoor hot tub, a soothing indoor jetted tub, a flat driveway for easy arrivals, and a gas fireplace for cozy mountain nights. Pets here can enjoy the grassy areas and the quiet stream running past the cabin. Relax during easy-going afternoons watching movies on the large flatscreen by the fire and shooting pool in the rec room before sitting down to lunch with lots of natural light pouring in through the tall windows. 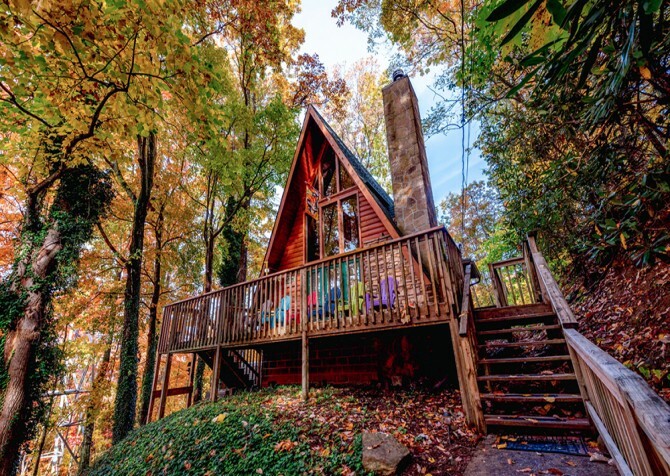 Situated in the mountains above Gatlinburg, The Raven's Nest is a 3-bedroom, 2-bathroom, A-frame cabin with charming wooded views. Enjoy sweet dreams on the king-size bed, play card games by the fireplace, splash around in the community pool, battle your siblings on the foosball field, take an evening soak in the hot tub, and stream your favorite show on your flatscreen TV. 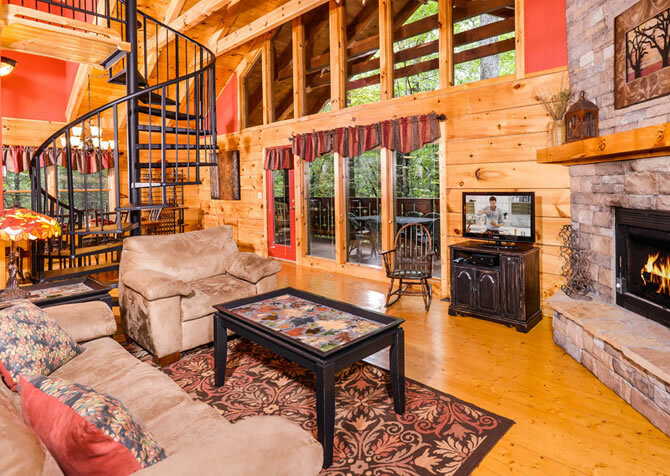 Spend a family vacation in Gatlinburg in this 5-bedroom +loft cabin rental. An enclosed hot tub is great for a dip any time of year, while the secluded location allows you to feel worlds away. 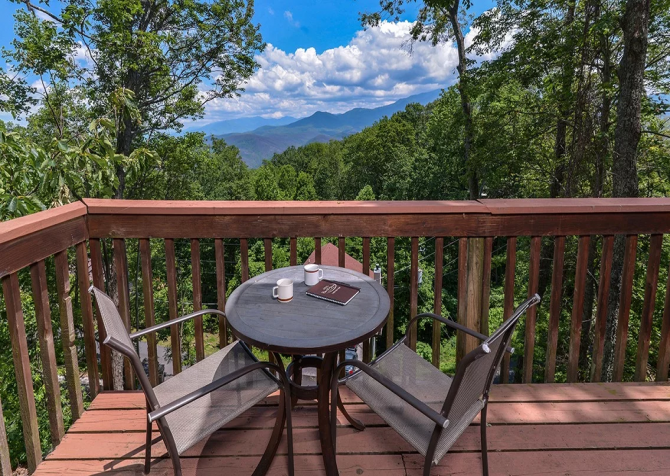 This pet-friendly cabin is located near the Great Smoky Arts and Crafts Community and boasts a covered deck with mountain views where you can sip some coffee or unwind after a busy day exploring the shops and attractions. Been dreaming of an escape with your special someone? 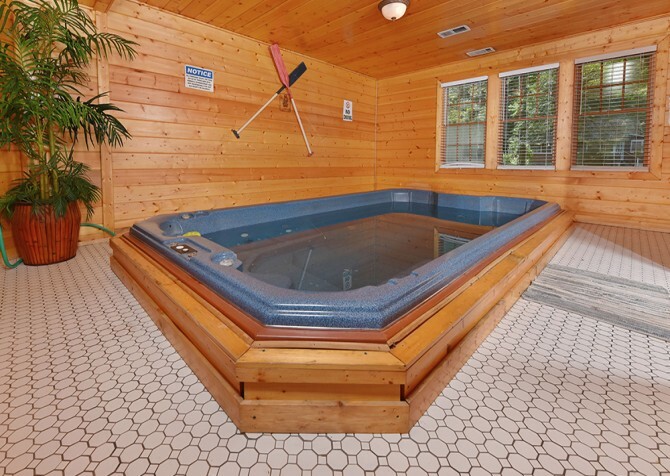 You will adore this 1-bedroom Gatlinburg cabin rental that features its own private pool. Stainless steel appliances and a log interior give this cabin a modern feel while a cozy living area with gas fireplace makes it a great choice for a couple. Take a stroll to nearby downtown or play a round of pool to pass the time on your vacation. From homemade meals in your fully equipped kitchen to a king-size bed and custom tiled walk-in shower, Swept Away offers the comforts of home and lots of perks in between. 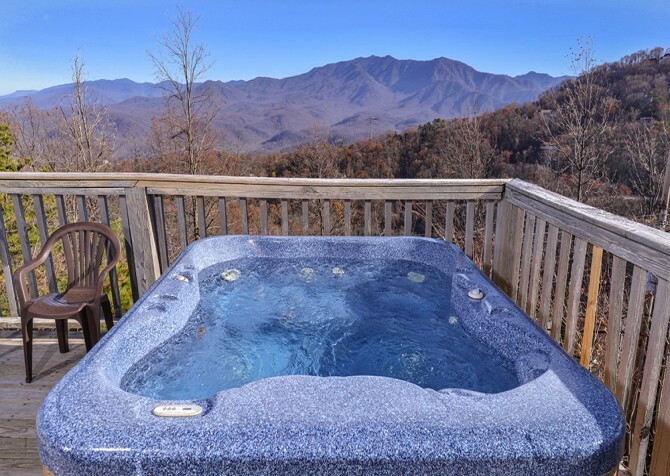 Soak in the outdoor hot tub or indoor jetted tub after a long day hiking in the Great Smoky Mountains National Park, soak in mountain views, relax in front of a 70-inch TV, play pool and arcade games on days around the cabin, and more! 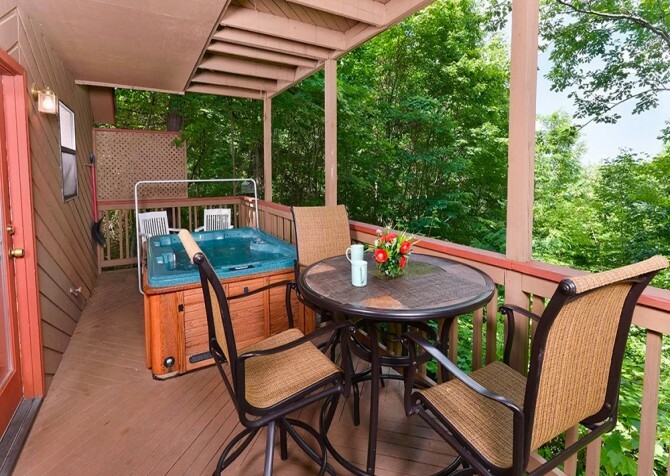 Located in the hills of the Smoky Mountains, Lover's Retreat is the ideal couple's getaway. 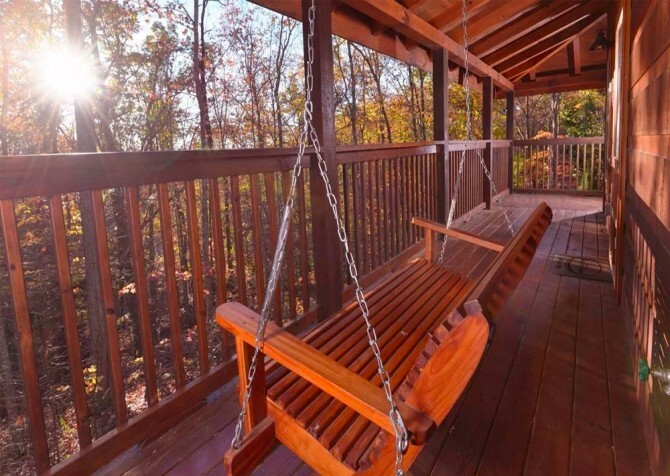 Sit in the rocking chairs while taking in the peaceful wooded views. 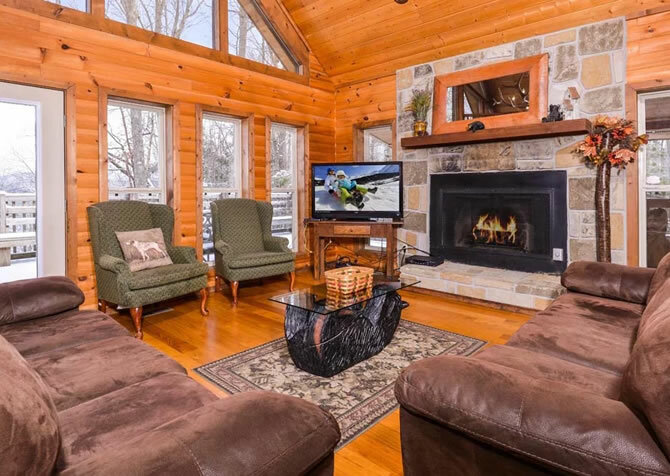 Inside, curl up in front of the big screen TV for a romantic movie, soak in the indoor jetted tub, or kick back in front of the gas fireplace on a cool mountain night. Also enjoy community pool access during your stay! This 4-bedroom cabin with room to sleep 13 is a comfortable escape from the hustle and bustle of the city. And with a location just a few miles from downtown Gatlinburg, it's also close to the many fun attractions and restaurants of the area. Kids and friends will love the room with 3 beds and a flatscreen TV, and everyone will love gathering in the living room for TV, movies, and board games. 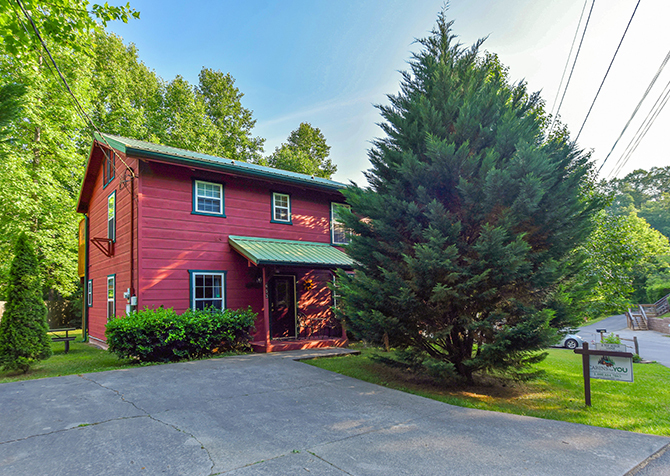 Close to downtown Gatlinburg with comfortable interiors, this 3-bedroom (plus loft), 3-bathroom cabin can accommodate up to 8 guests. 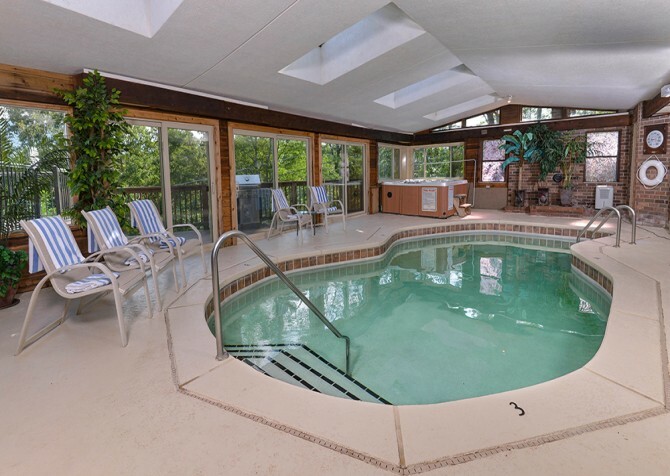 Its semi-private location provides peace and tranquility, and its location in Condo Villas of Gatlinburg offers guests pool access. Paradise also boasts a charcoal grill, pool table, high-speed wireless, an indoor jetted tub, and an outdoor hot tub.